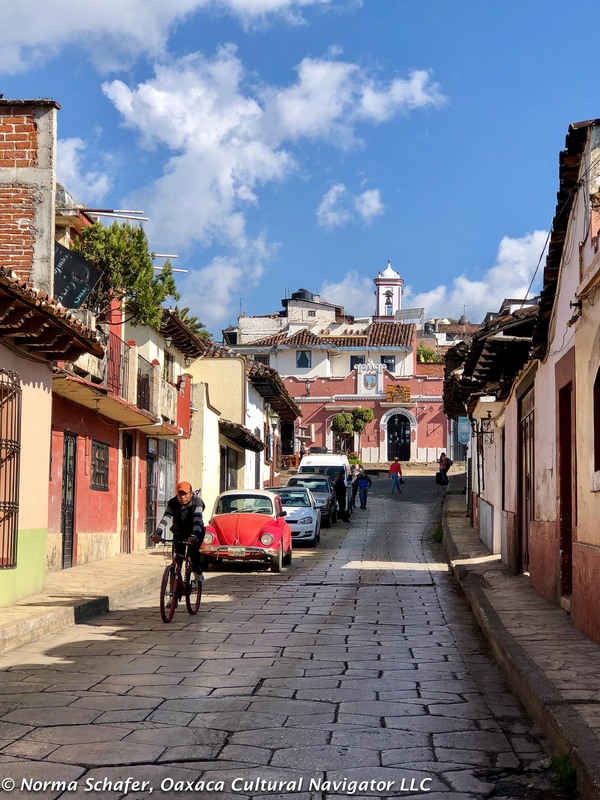 Wandering around San Cristobal de Las Casas last week I discovered Punto y Trama, on Belisario Dominguez #13b, just two blocks off the Andador Real de Guadalupe walking street. What drew me in was the sign on the door that announced PomPom workshops. Then, once inside I immediately noticed the furry wool Chamula woven shawls adorned with PomPoms. A new fashion trend, I noted. 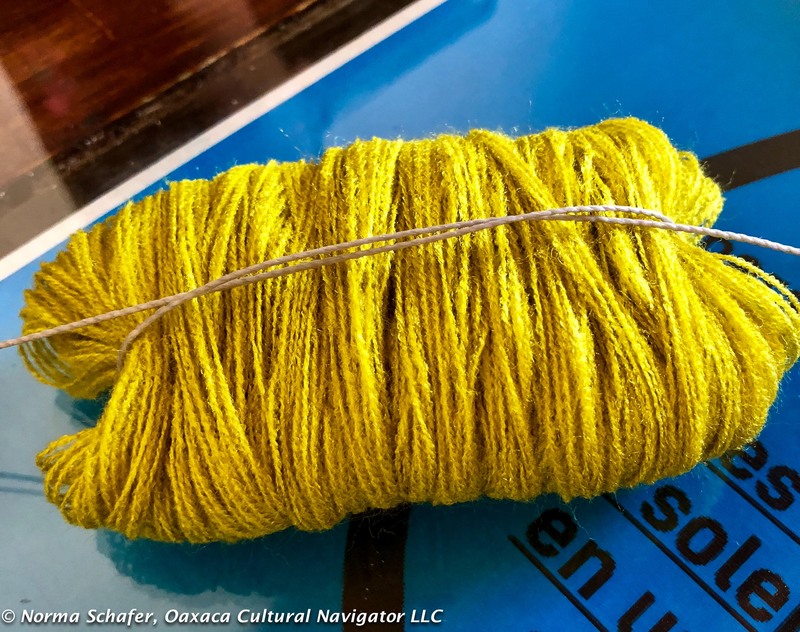 First, you wrap 6 threads of yarn around a tube 150 times. Slide the yarn off the tube. 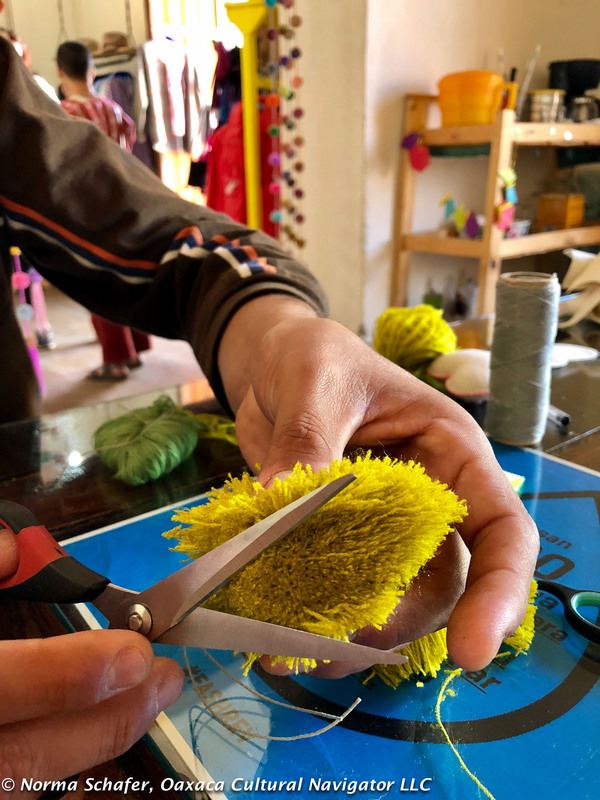 PomPoms are big here in San Cristobal. They dangle from everything: necks, ears, wrists, shoulder and handbags, woven string shopping bags, and garments. They serve as functional ties and outrageous adornment. Sometimes they are combined with hearts, beads, Frida portraits, tassels. 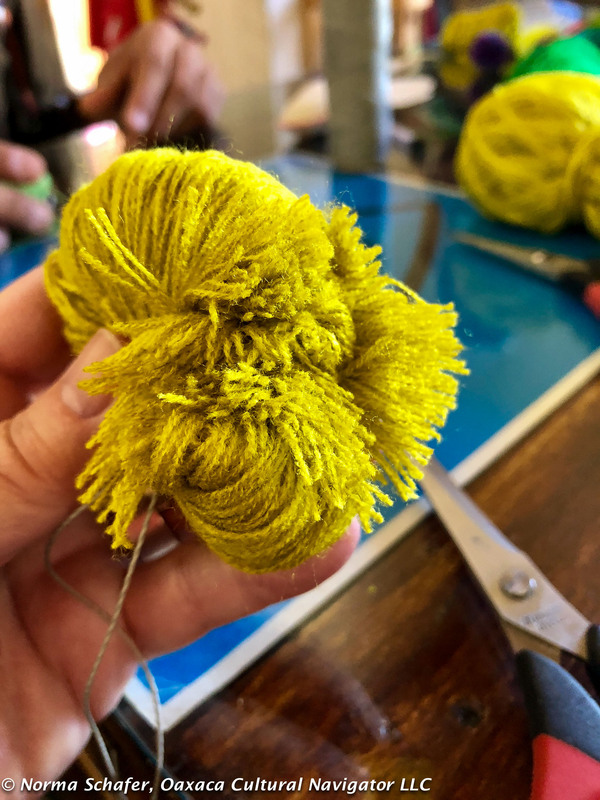 I decided to take a PomPom making workshop, fascinated by another way to work with fiber as part of textile and clothing design. 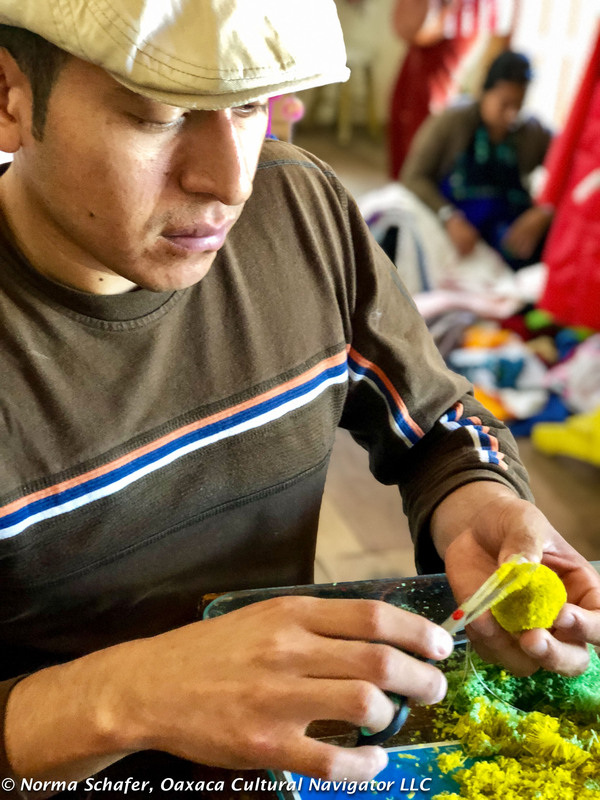 This is a three-hour one-day workshop OR six-hour two-day workshop taught by Lazaro Ramirez, whose family is originally from Magdalenas Aldama. The cost is 350 pesos per session. That translates to about $18 USD at the current exchange rate. 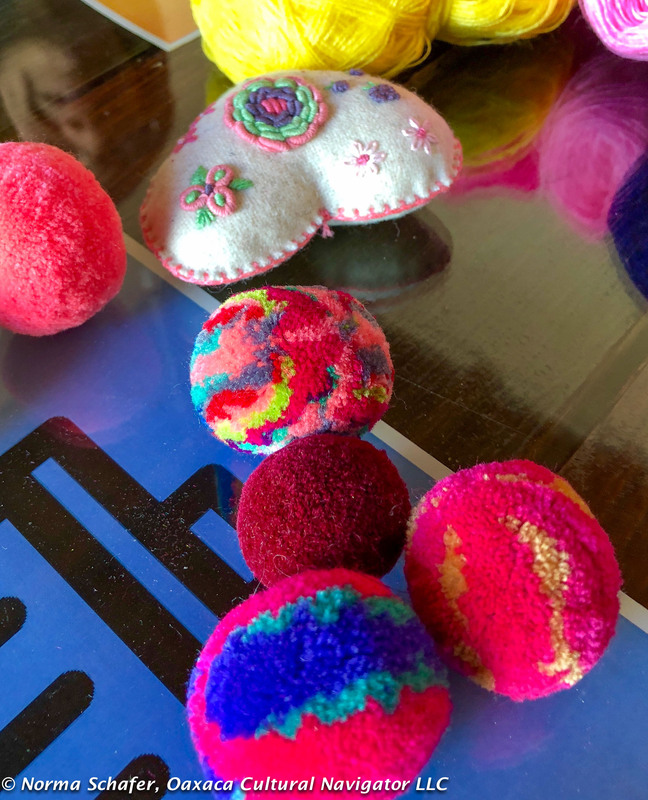 At the end of three hours I had made three PomPoms. I decided to order the quantity I wanted from Lazaro instead of making them myself. 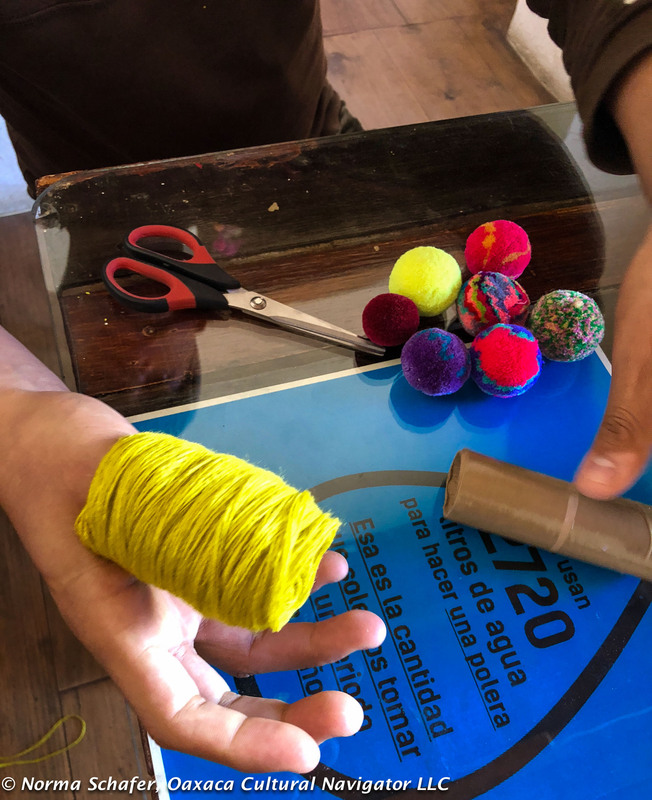 The class exercise gave me a great appreciation for the time needed to craft one PomPom, which he sells at 15 pesos each. And, each one is perfect. The green one is almost done but still ragged. Yellow is perfect. Fifteen pesos each equals about eight cents. That’s eight cents an hour, including labor and materials. 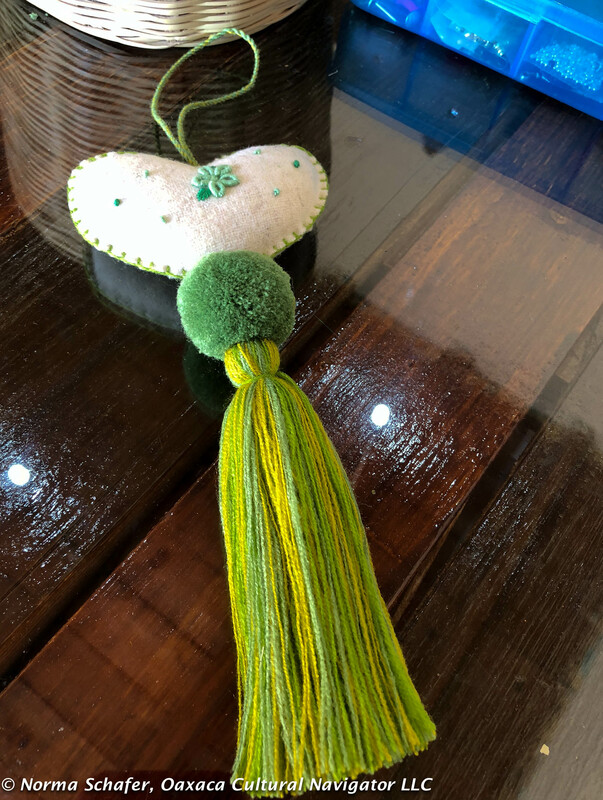 Here is the PomPom and tassel I made. Lazaro made the heart. 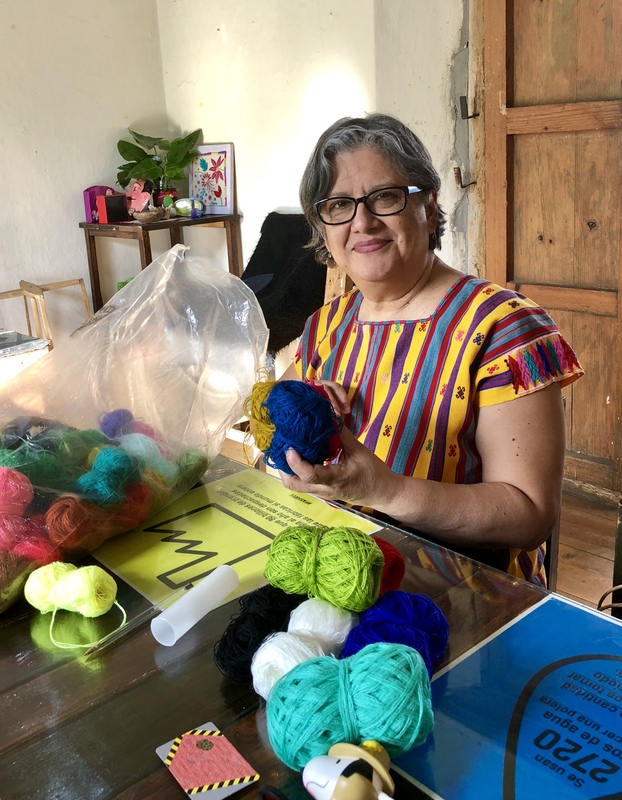 Lazaro says you can use wool to make the PomPoms, but synthetic polyester yarn is finer and gives a tight, compact product with glorious colors — electric, like the people here prefer. I learned all the wrapping, tying and cutting techniques. 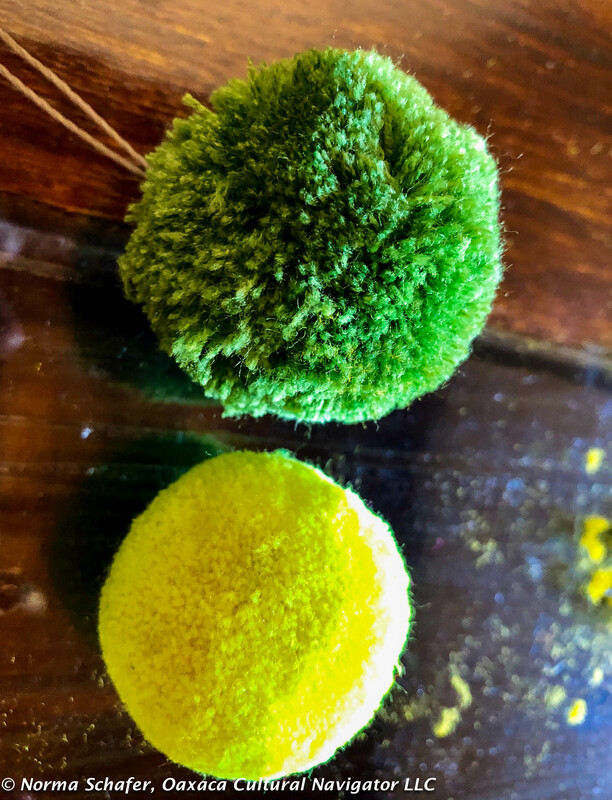 The most time consuming is to hold the PomPom at the “north and south poles” and to cut along the “equator,” constantly turning until a perfect ball forms. Not an easy task, I learned. Inspired, Juanita takes the class tonight. I intend to use the PomPoms to decorate the checked wool shawls I bought in Chamula last week. They make great pillows, bed throws, or a shoulder covering on a chilly night — with pizzazz. 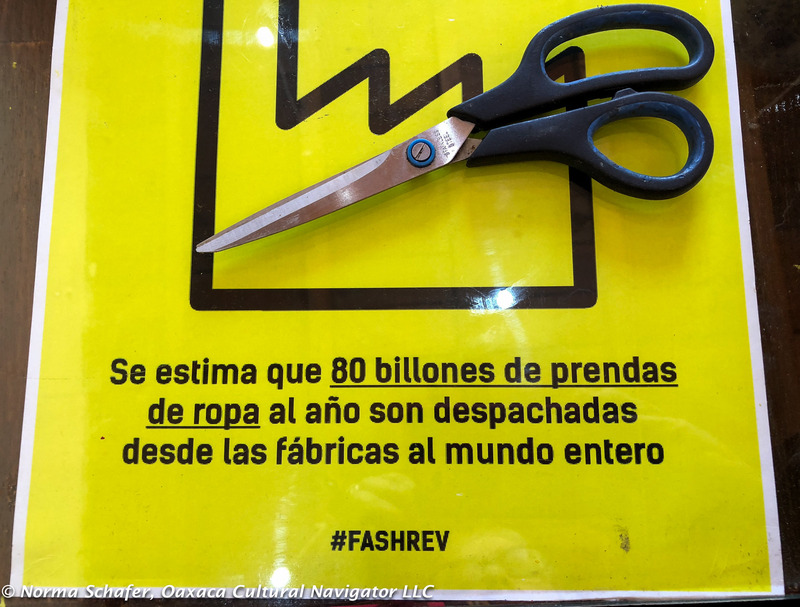 #fashrev: It’s estimated that 80 billion pieces of clothing are shipped from factories and distributed around the world. I constantly ask: Who made my clothes? 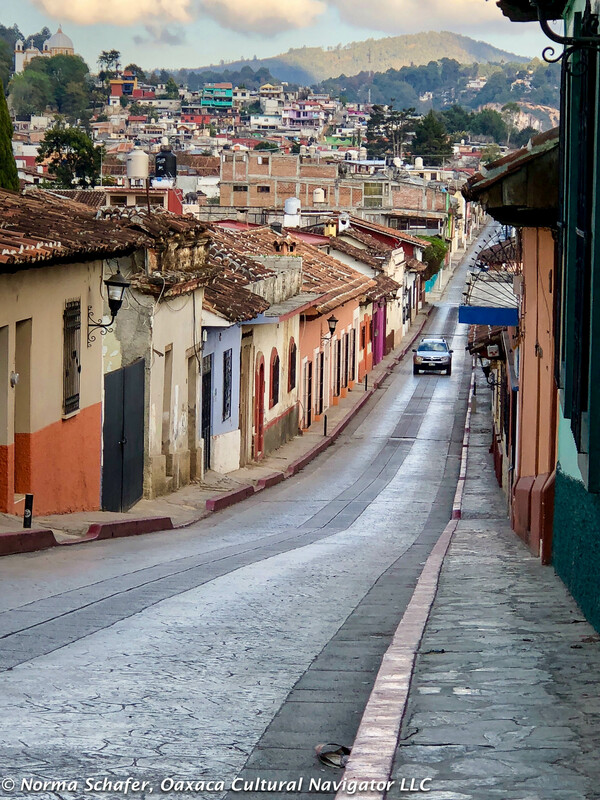 Zinacantan is about thirty minutes by taxi from the center of San Cristobal de Las Casas. They grow flowers here. Large greenhouses dominate the landscape like a checkerboard rising from the valley to the hillsides. 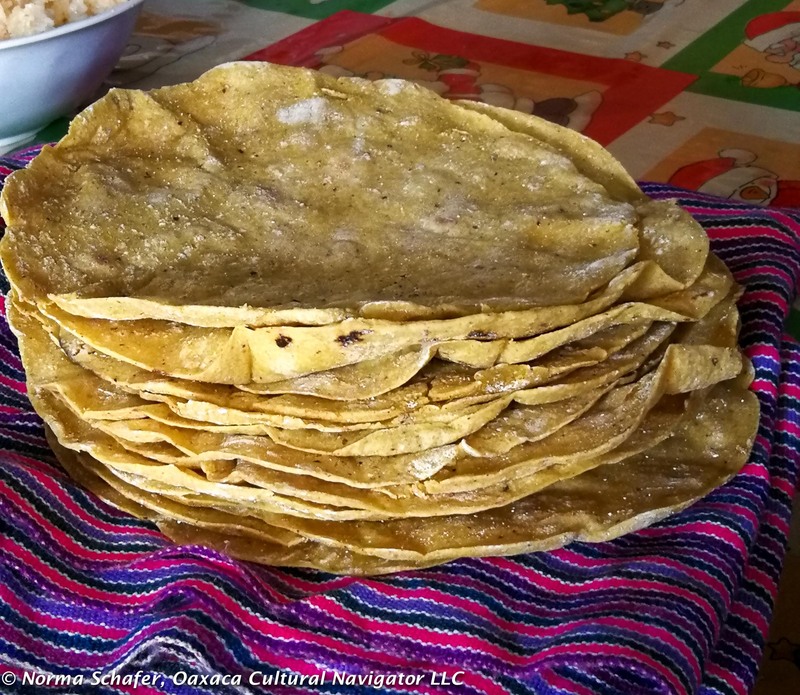 This is a prosperous community that exports this produce throughout Mexico, as far as Mexico City and Merida. Local dress reflects this love of flowers. 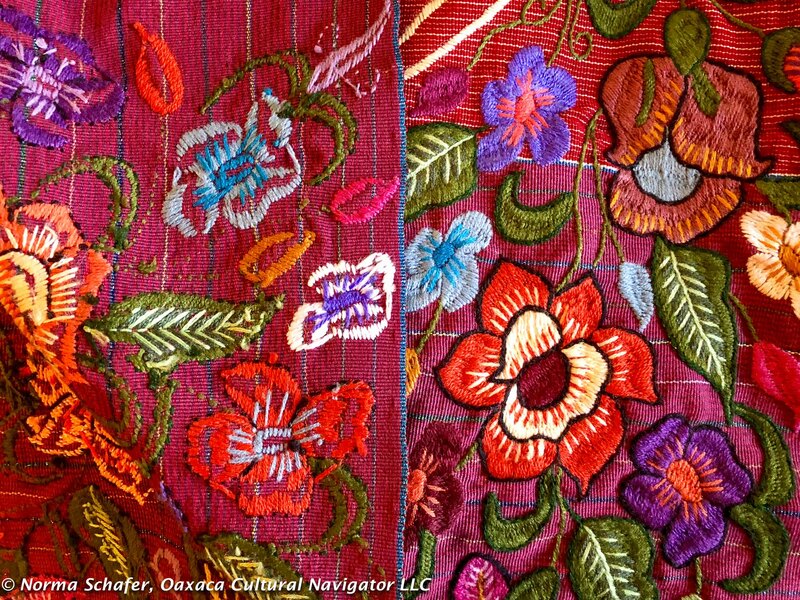 Women’s skirts and chals (shawls), men’s pants and ponchos, and rebozos to cradle babies are densely embroidered with flower motifs. Machined cross-stitch embroidery. Can you tell the difference? It used to be that this work was all done by hand. 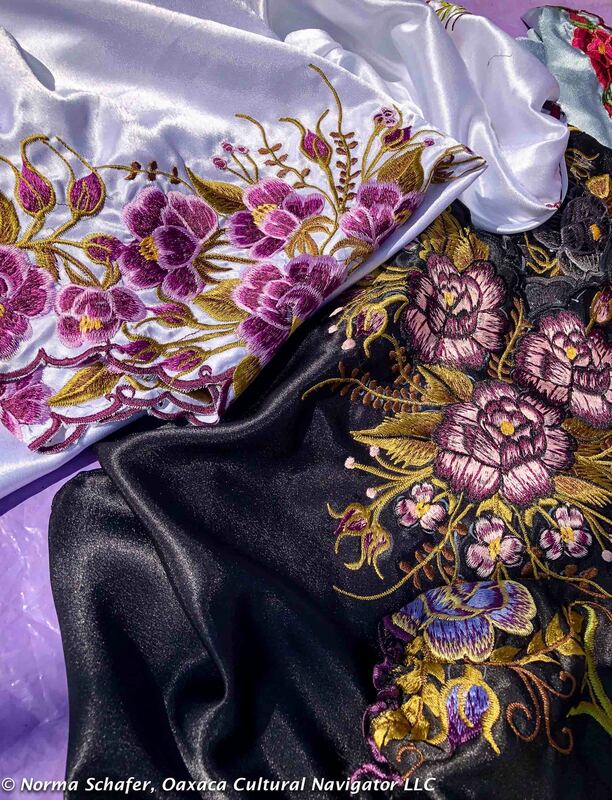 Now, the embroidery machine has taken over the life of the cloth, which is often completely covered in intricate flower motifs so dense you can hardly see the base fabric. It used to be that the base cloth was woven on a back strap loom. This is now rarely the case. Most is either woven on the treadle loom or by commercial machine. Bling blouses–machine embroidered bodices on shiny synthetic cloth. Beautiful. It used to be that the village was identified by its hot pink cloth. Now, we see purples and blues. It’s common to see shiny colored threads in both the woven cloth and the embroidery thread. Fashions change and the Zinacantecas innovate new designs, use new color variations, and new embroidery motifs. 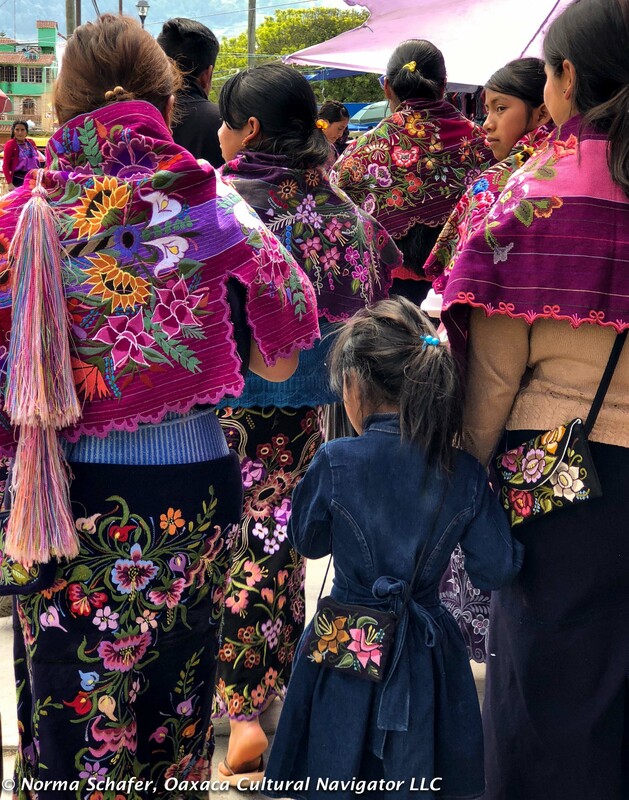 Far beyond Mexico City, Mexican women love their bling. 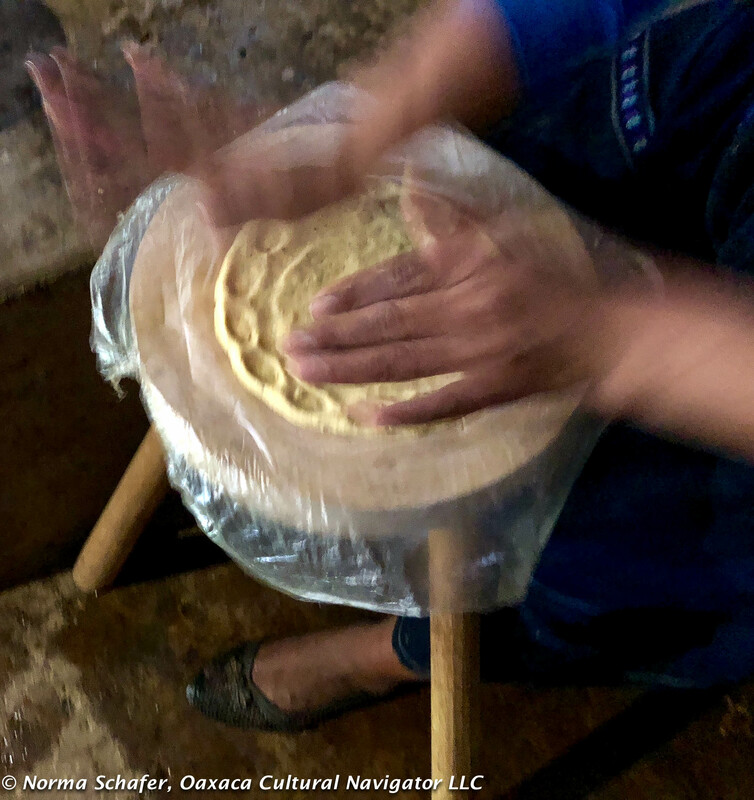 Sheri Brautigam and I went early to Zinacantan yesterday on a discovery trip to check out new places to take the next Chiapas Textile Study Tour group. Sunday is Zinacantan market day but you have to get there early. 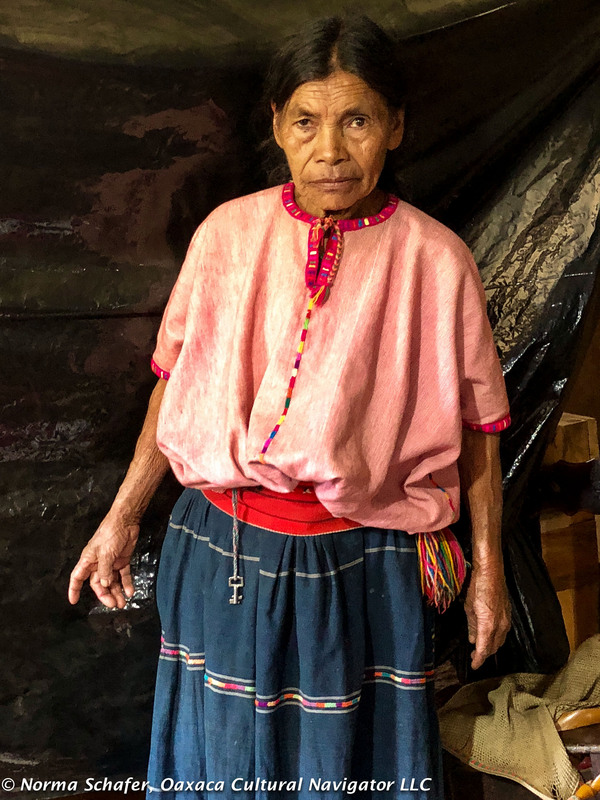 The women with textiles have spread out their wares on the street at 6:00 a.m. and start putting their things away by 10:30 a.m.
Our best advice is go there first before Chamula. 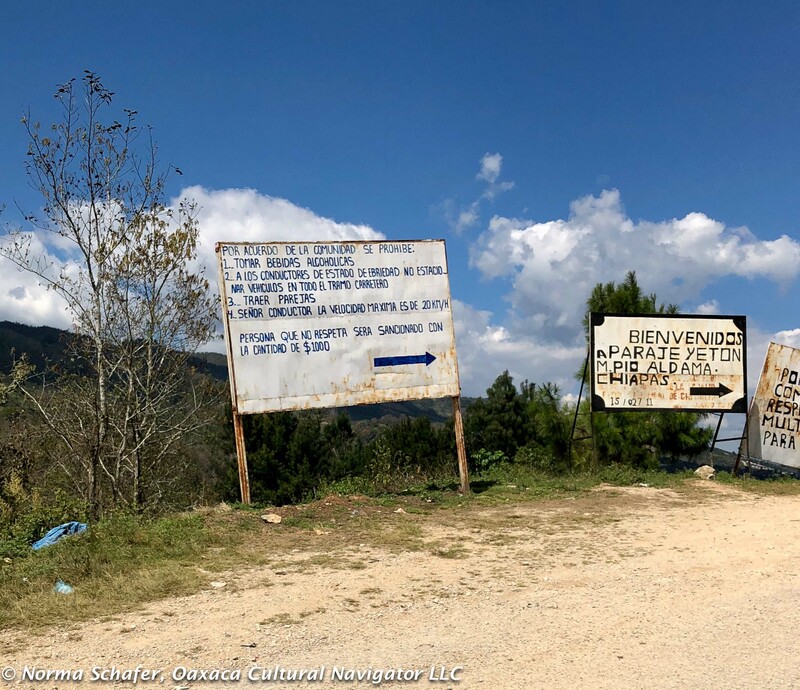 2019 Chiapas Textile Study Tour. Taking reservations now. 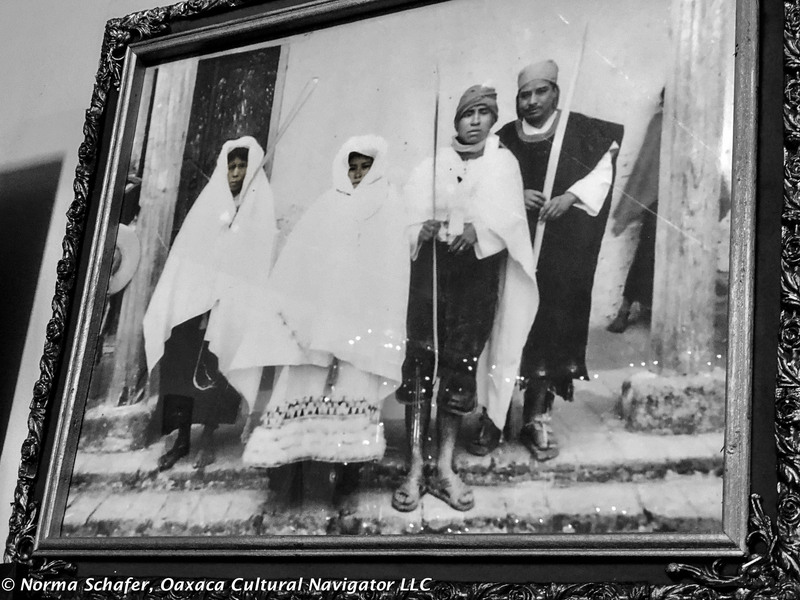 Wander the streets off the Zocalo. There are homes and stalls that sell good new and vintage textiles. The old pieces might be ten, fifteen or twenty years old. People stop wearing them because the colors are outdated not because the cloth is worn. You can easily spend an hour here. 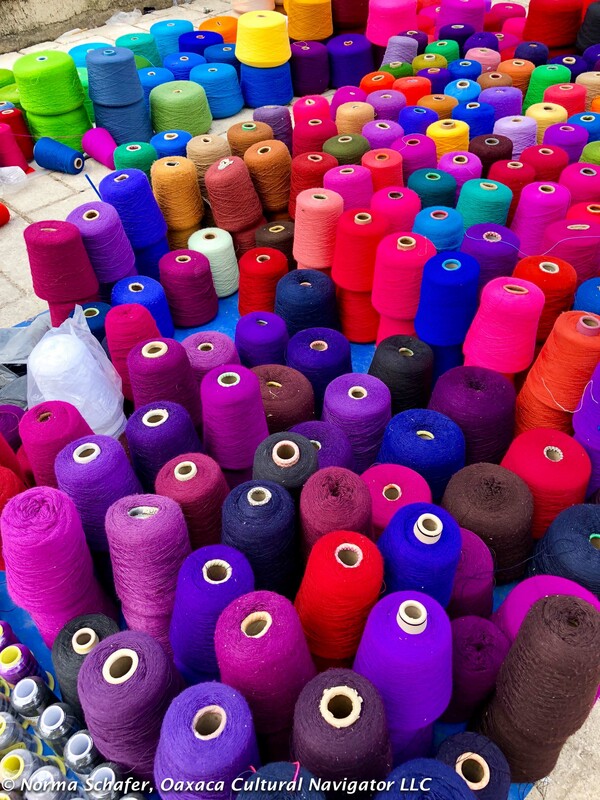 A rainbow of threads for embroidery machines in the market. Here you will find hand embroidered cloth woven on back strap looms. This could include cross-stitch (punto de cruz) and French knots, in addition to other traditional needlework. How can you tell? Turn it over and look at the underside. 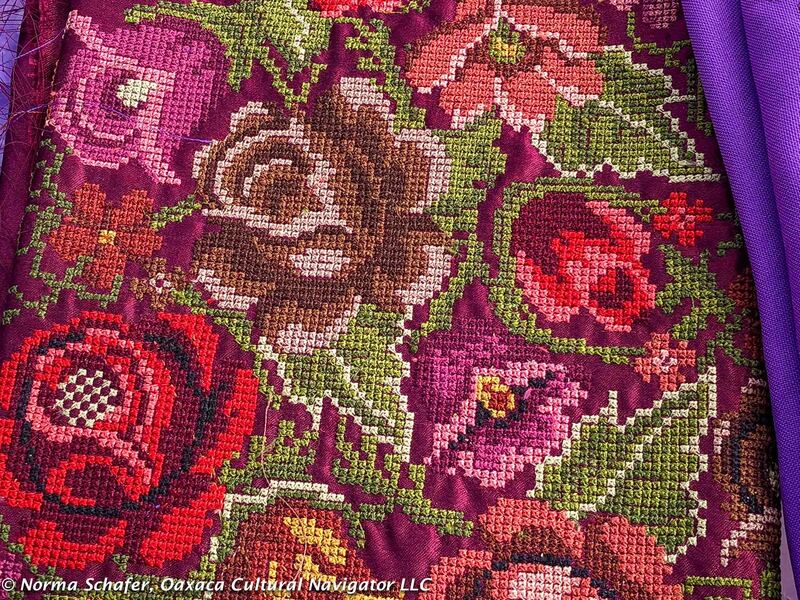 The embroidery machine has come to Chiapas and can replicate cross-stitch and everything else. 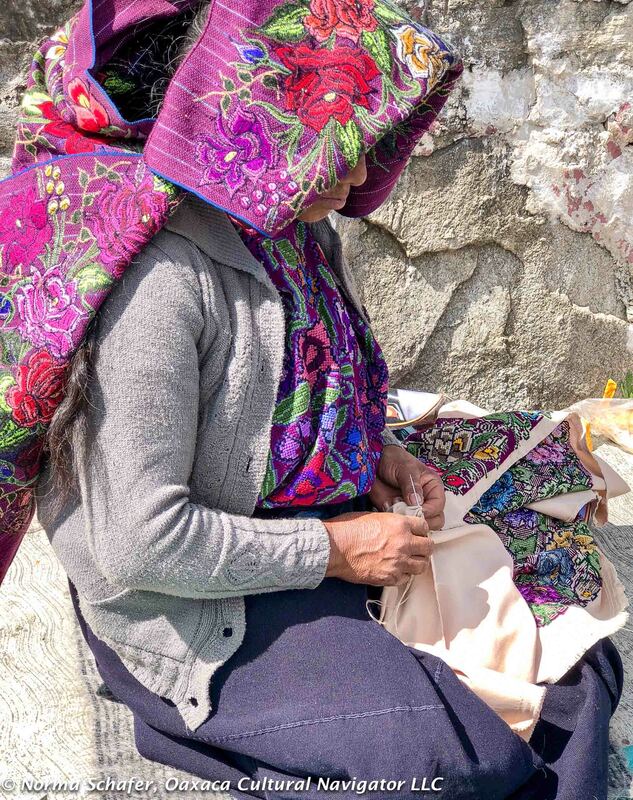 The village women now wear the work made by machine and it’s beautiful, too. Everything is a personal choice! 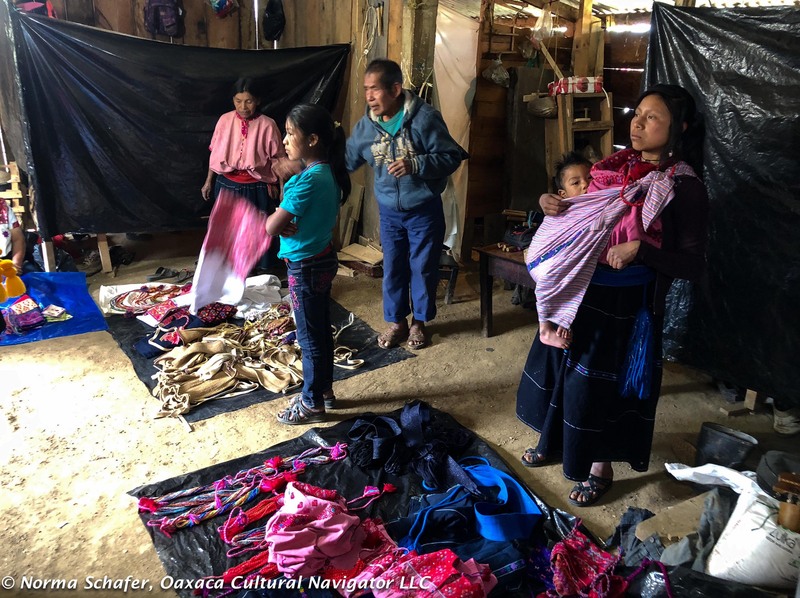 The obvious tragedy is the damage to the Church of San Lorenzo during the September 7, 2017, earthquake that rattled Chiapas and the southern Oaxaca coast. The destruction dominates the horizon. The church is closed until further notice by INAH. People say it may be impossible to repair. 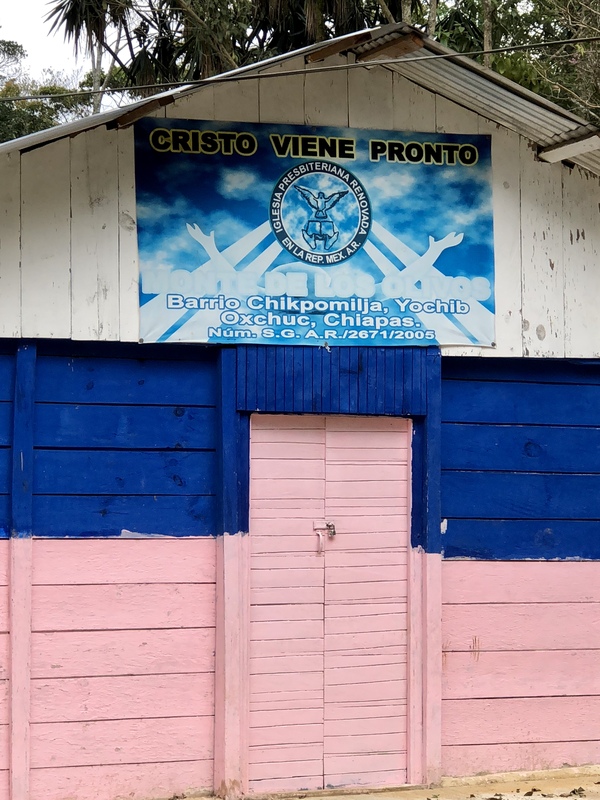 There is talk in the village about building another church. Saints in temporary corrugated home. Photo by Carol Estes. I remember entering the candlelit space in years past where all corners were adorned with flowers, abundant, fragrant. The altar was like a floral arrangement unlike any other I had seen. The aroma made me swoon. Now, the saints have been removed to a corrugated shed. INAH is responsible for all historic churches in Mexico. Few in and around San Cristobal de Las escaped damage. There is years of work to be done. Will Mexico have the will to repair? 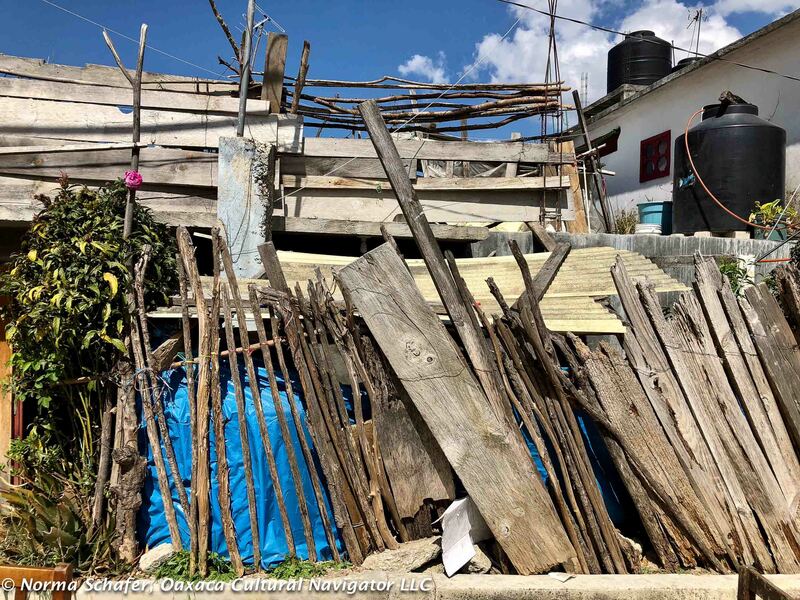 September 2017 earthquake toppled houses, too. 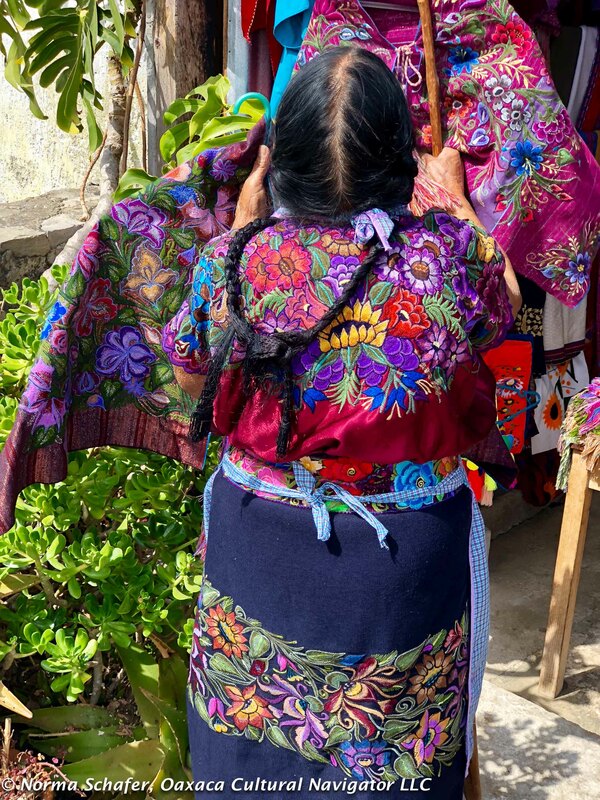 Back on the street we find hand-woven and embroidered bags, silky polyester blouses machine embroidered with complementary colors, belt sashes and skirt fabric. 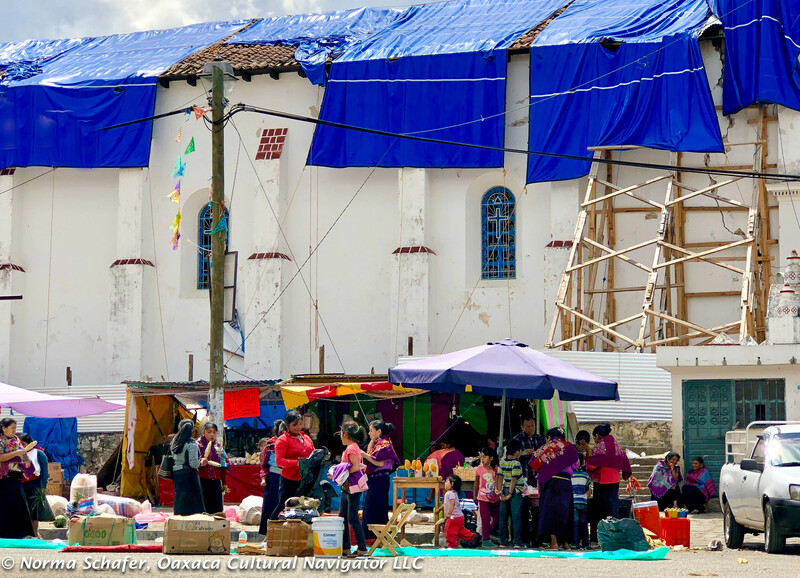 Since it’s market day, tarps are also covered with piles of fruits and vegetables, and staples for the home. The Aztecs ruled this territory before the Spanish. They dominated as far south as Nicaragua. The Zinacantecos had strong links with the Aztecs, and enjoyed a privileged trading relationship. 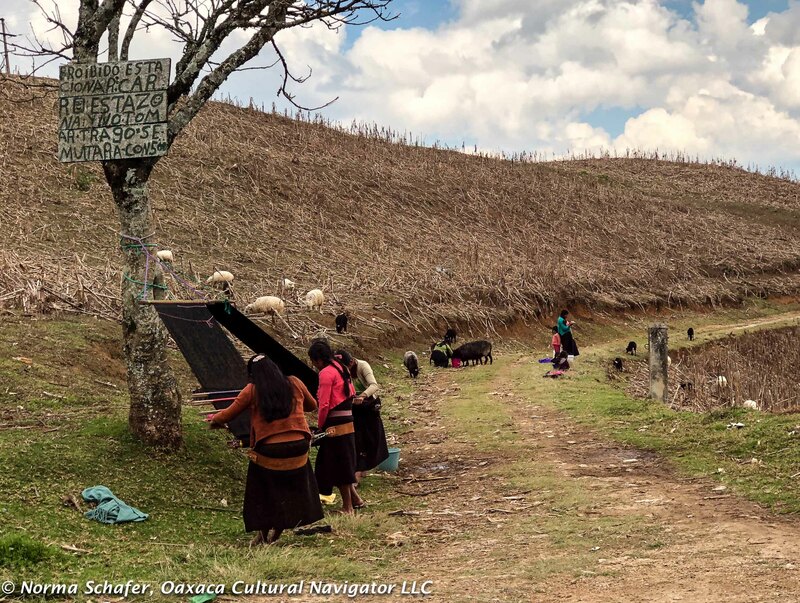 The village served as political/economic center for Aztec control of the region before the Spanish reached Chiapas in 1523. 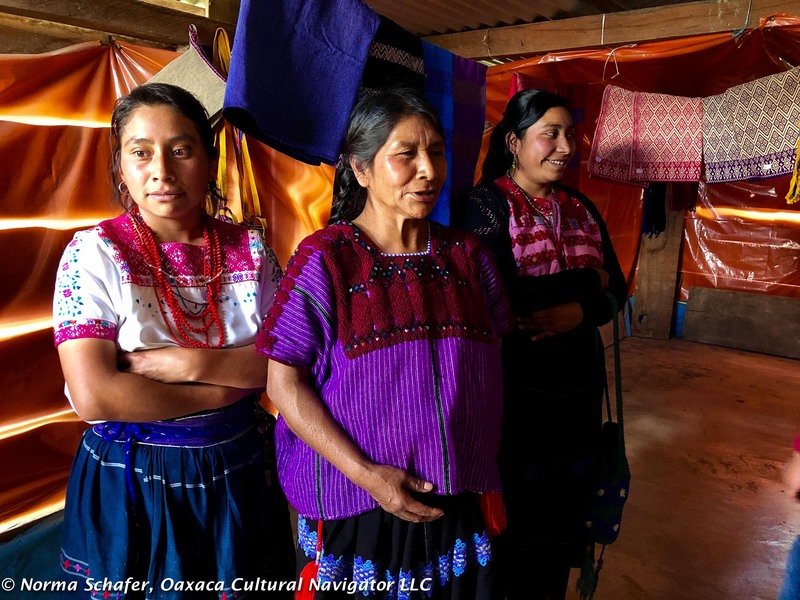 Our friend Patricio tells us that many locals intermarried with Nahuatl speaking Mexica’s. The Zinacantan feathered wedding dress is a carry over from this past. Taxi to get there, 150 pesos from San Cristobal de Las Casas. Taxi to return, 100 pesos. Get it at the back corner of the church before you enter the market street. It costs about 150 pesos to get there. 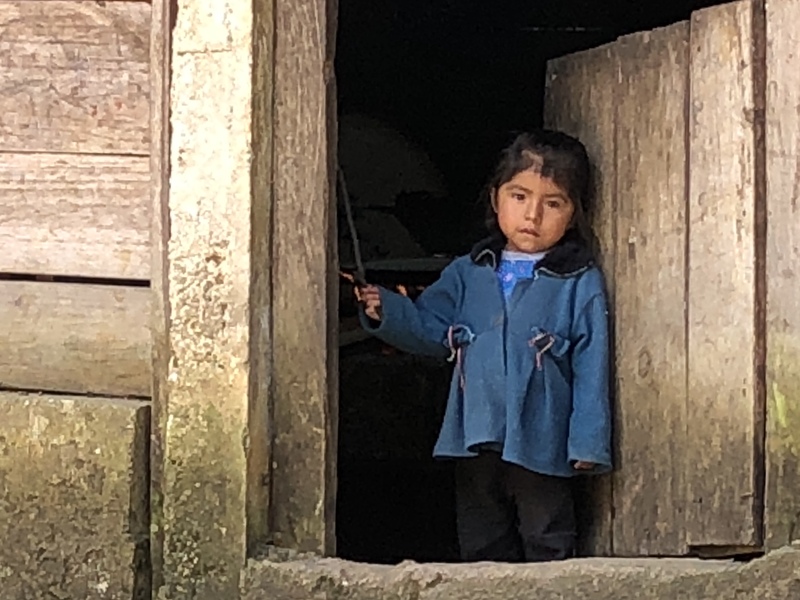 There is no better reality check to understand quality of life for Chiapas indigenous people than to travel the back roads into remote villages, where people live clinging precariously to mountain slopes. 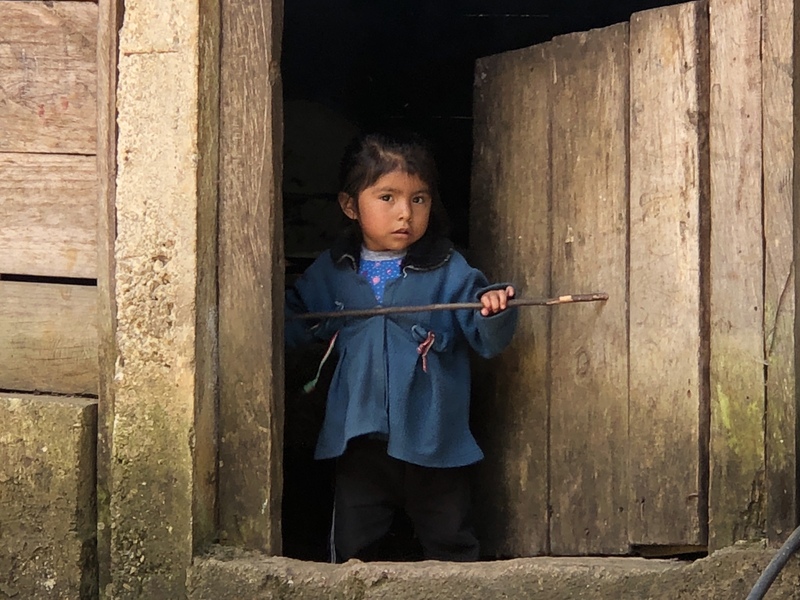 They get to their houses by walking narrow dirt trails, climbing up and down slippery paths sheltered by coffee plants, banana palms and an occasional pine tree. Through the coffee forest, 16 flights of stairs on this trip. This is a life of poverty. It is also rich in family connectedness, work for the common good, creativity and aspiration for economic well-being. This is hard-scrabble country with out-houses, planked wood dwellings, smokey cooking fires, bony dogs, and young children underfoot. Extended families live together. 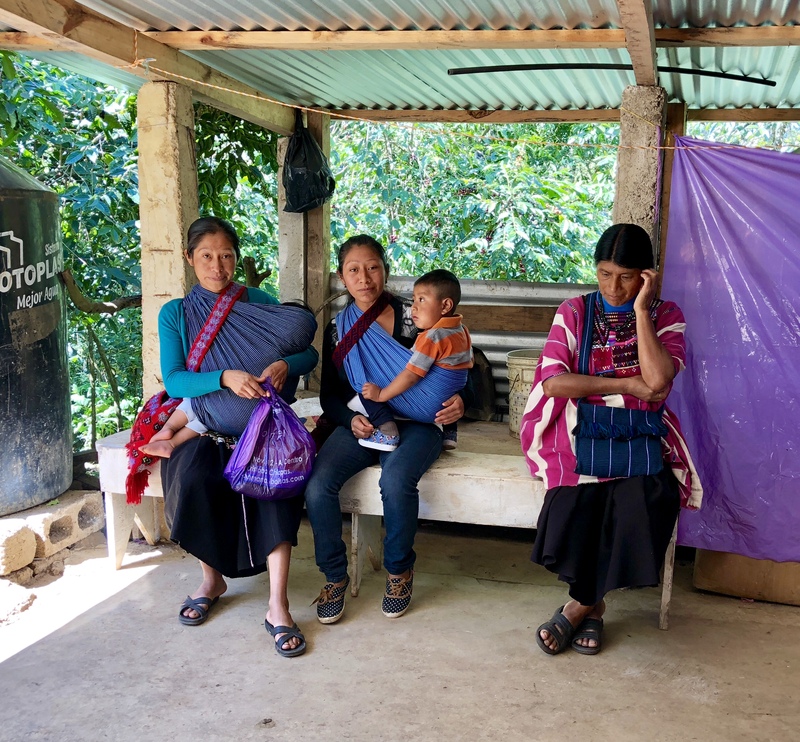 Young women, some teenagers, some barely into their twenties, carry toddlers on their backs, constantly shifting the weight, re-tying the rebozos to keep the bundle secure. Moving the bundle from back to front as child fusses. Breast is close at hand more for soothing than nourishment. This was not a shopping day. 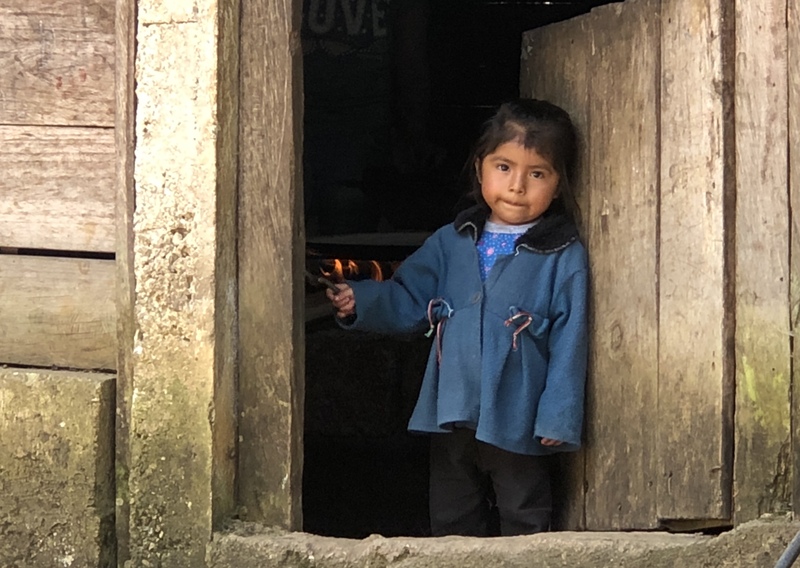 Huellas Que Trascienden introduces six of us to the people they work with as part of their economic-business development projects in the region. 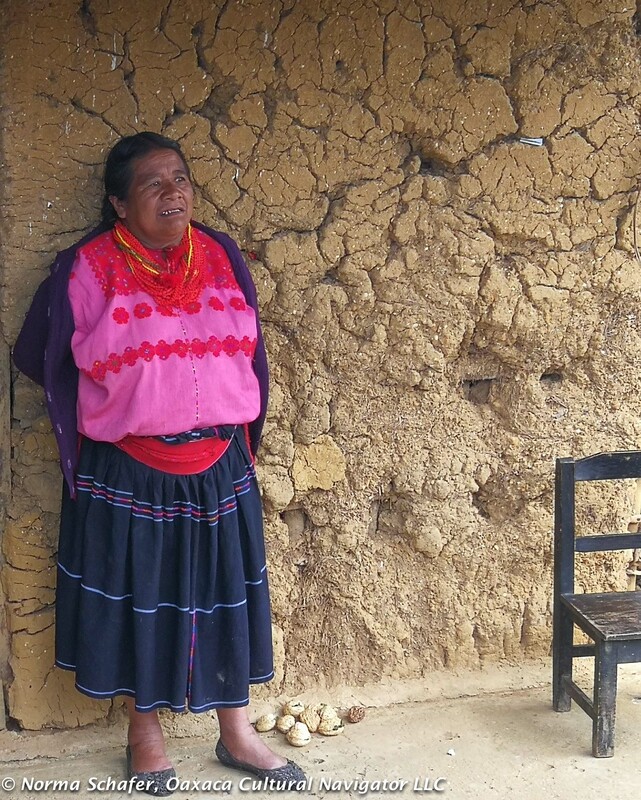 Their goal is to educate Maya women and men to become self-supporting. In San Cristobal de Las Casas they operate their foundation headquarters at Maria Adelina Flores #22 (at the corner of Colon). 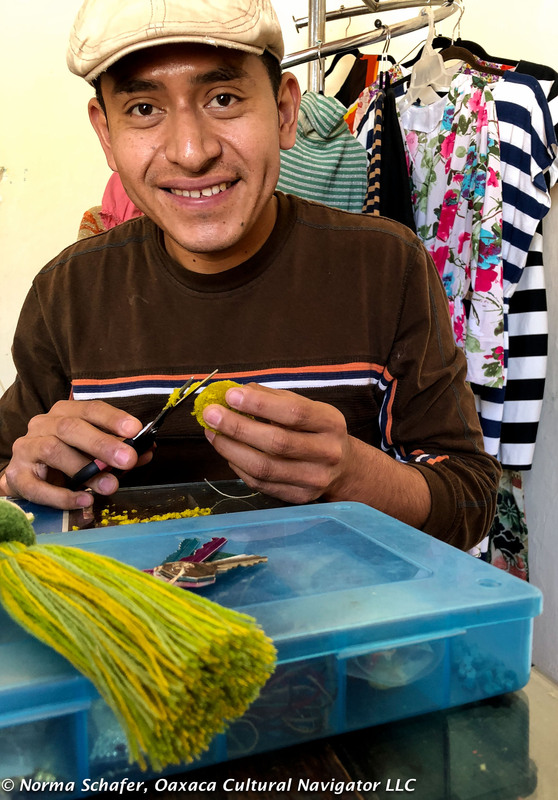 Here, they train weavers through a project called Artisan2You,to become more savvy with business, open bank accounts, run online stores and become independent. 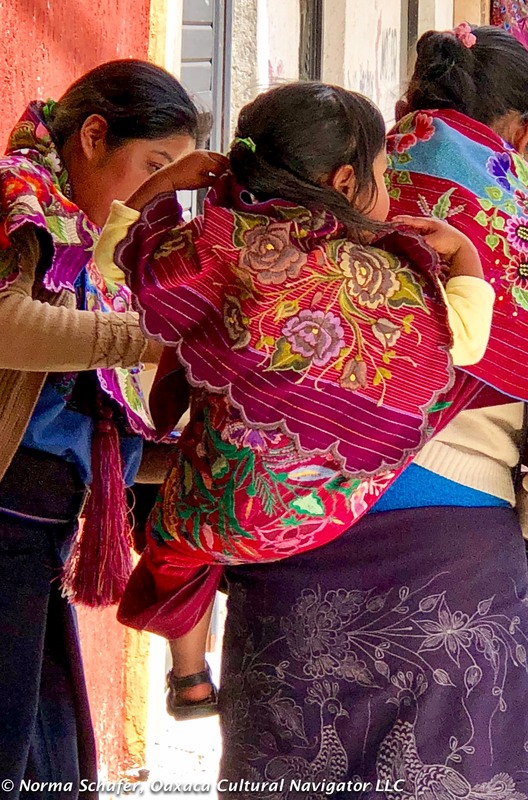 Join us for the 2019 Chiapas Textile Study Tour. No rough rides! Women earn the full amount of the textile sale at Artisan2You. They are individually recognized with a photo and their name on the clothing hang tags. The Huellas Que Trascienden takes no commission or mark-up. Finally, we know who made our clothes! 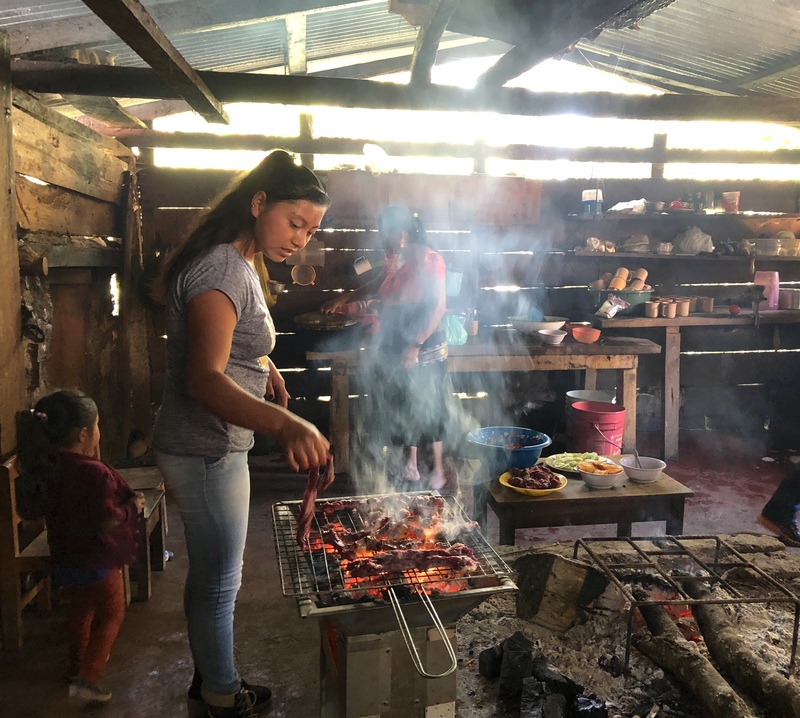 Leticia grilling the meat. Our visit warranted a feast. 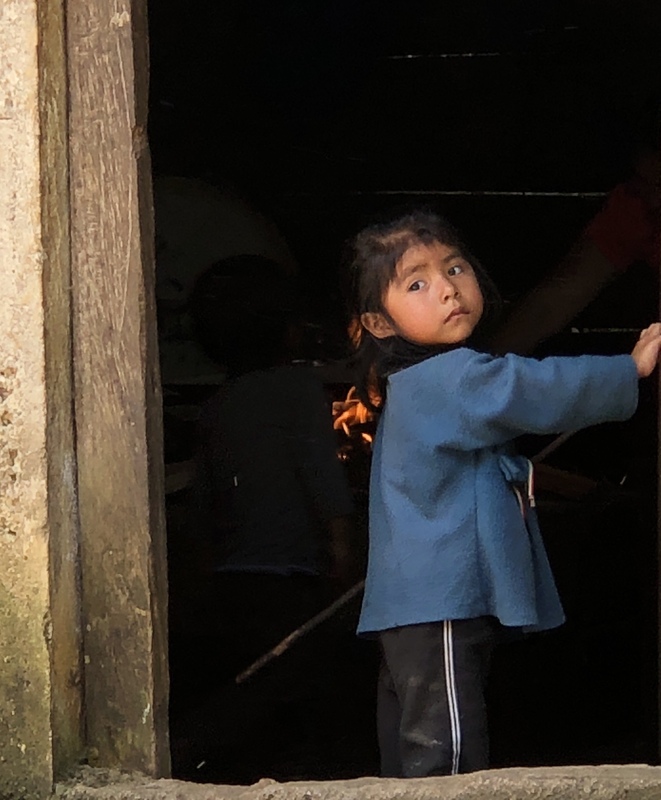 I take the trip to meet Leticia and her family in a village where I’ve never been. 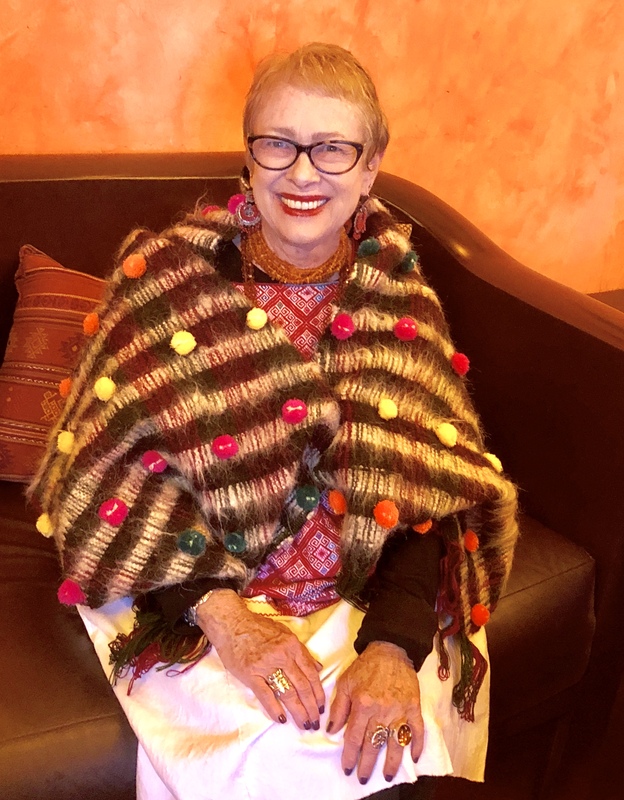 Leticia wove a beautiful poncho for me, which I wear today in honor of her skill. She is twenty-seven years old with four children. 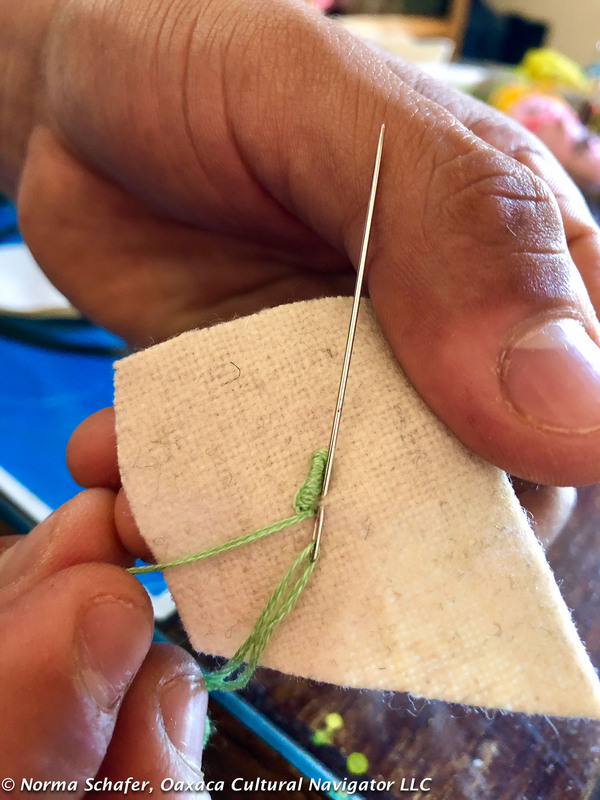 She learned from her mother Catalina, a master weaver. Once she wanted to escape to the city. 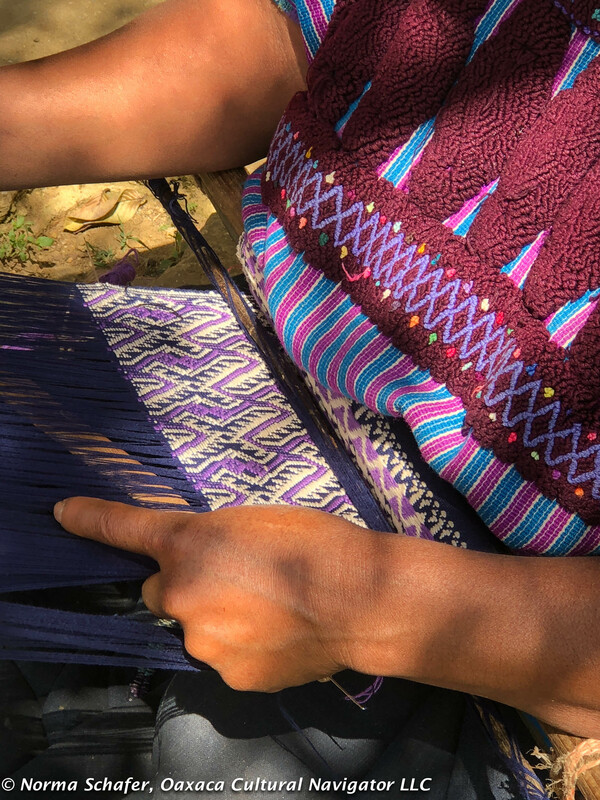 Now, her weaving brings recognition and self-esteem. 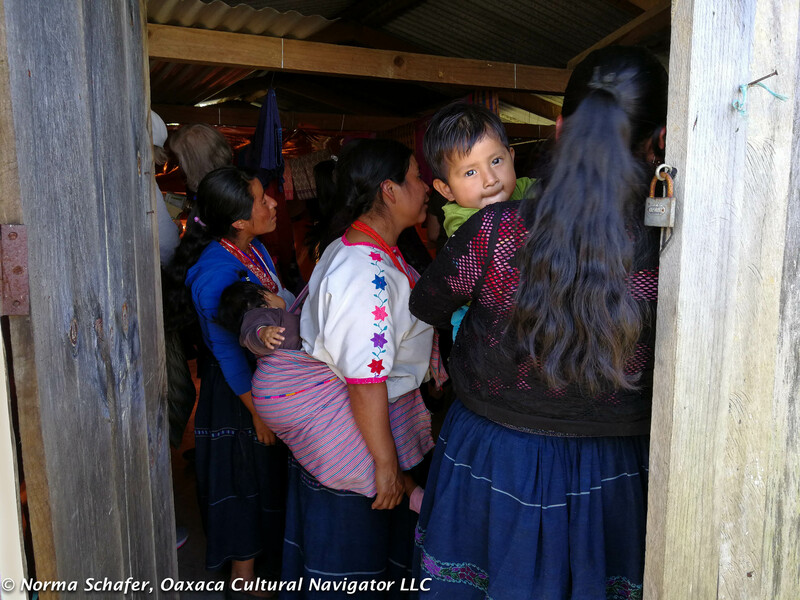 It’s almost two hours to Yochib in the Oxchuc district of Chiapas. 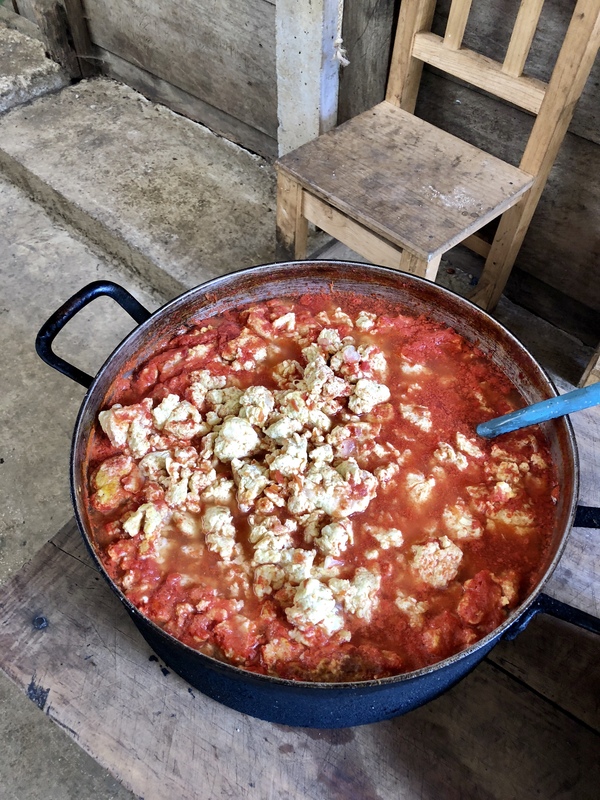 After a stop in the Tenejapa market, we climb on switch-back roads, then descend into a warmer, more humid climate. The banana palms tell me we are close to the rainforest. All of us start to peel off the layers we are wearing. It’s a rough road with hairpin turns. We pass courtyards where coffee beans are drying on plastic tarps. 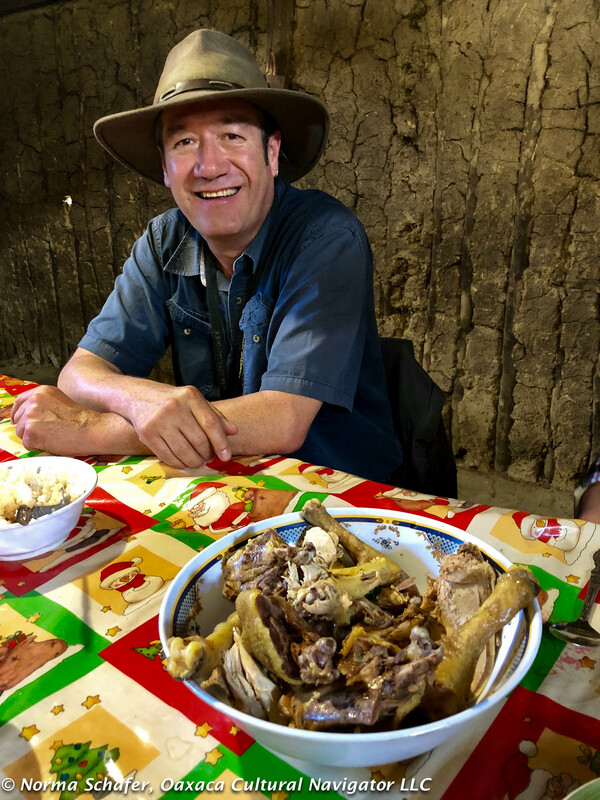 We pick up Pablo Santis who will translate for us from Tzeltal Maya to Spanish. I’m the only non-native Spanish speaker in the group and I’m far from fluent. I’m constantly attentive to be able to “get it.” The indigenous language is predominant here and few speak Spanish. 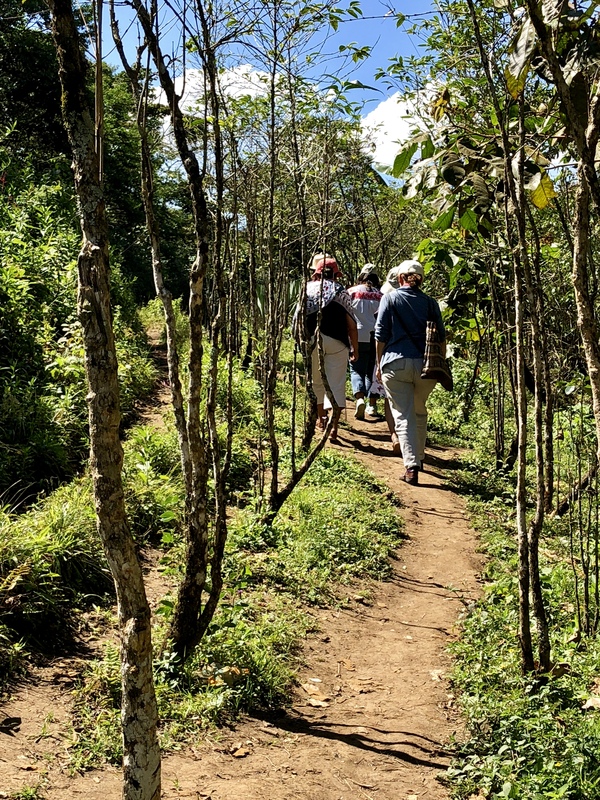 Off the van, we follow the trail by foot deep into the coffee groves, down, down. I think, OMG, I’m going to need to climb out of here! I clocked 16 flights of stairs by the end of the day. The altitude, I’m told, is 2,000 meters. That’s 6,562 feet. At the end of the trail we meet Alonso Gomez Lopez and his family. It’s noon. We had left at 8:00 a.m. Lunch is served around a large square table. Grilled meat. Sliced cucumber. Scrambled egg in chicken soup. Hot, sweet coffee. But first, Don Alonso pulls out his bible and recites a prayer of Thanksgiving. During the meal he strums guitar and sings. It’s then I realize that the family is evangelical Christian, not traditional Catholic. He sits but doesn’t eat with us. He says he is fed by his faith. 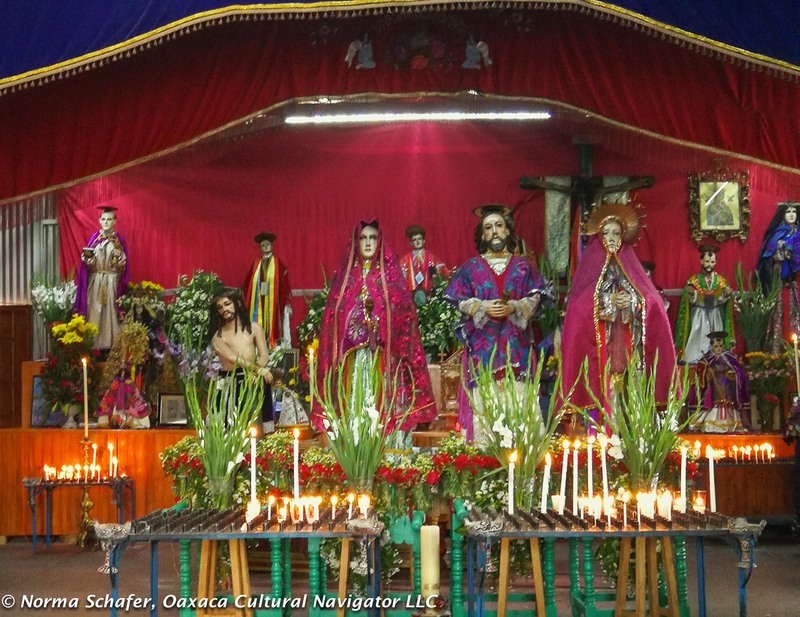 In Chiapas, less than 65% of the population are traditional Catholics. 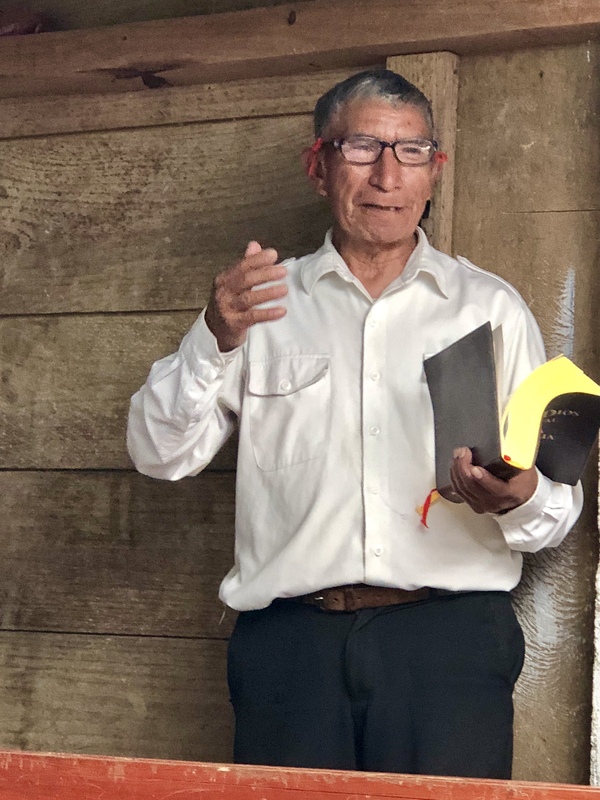 Don Alonso is a minister in the Renewed Presbyterian Church. He asks me my religion and I tell him, adding I am happy with what I believe. I’ll see you up there, he says. I smile. Our lunch feast around the community dining table. 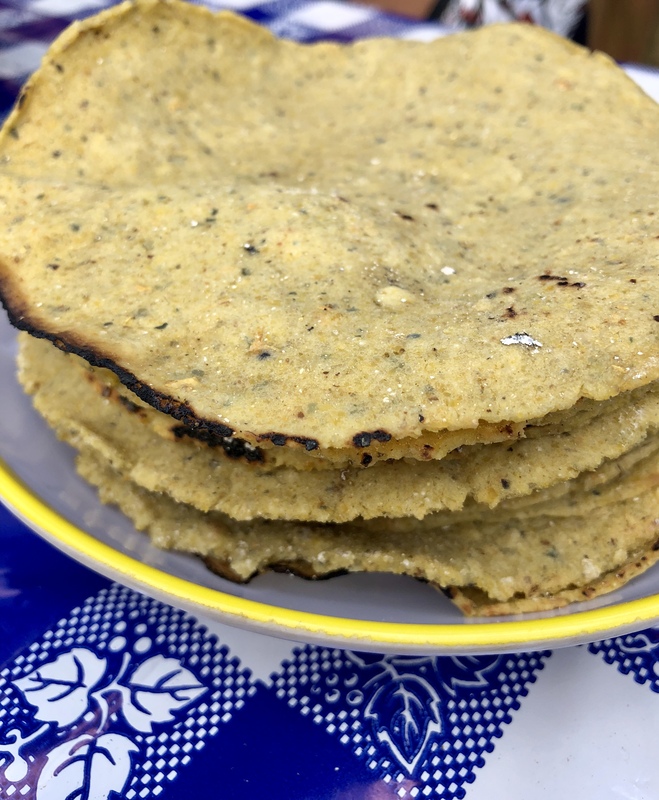 Mauricio Raigosa, the founder of Huellas Que Trascienden, is from Monterrey and makes his home in Sancris. He is a chemical engineer with an M.B.A. from a French university. 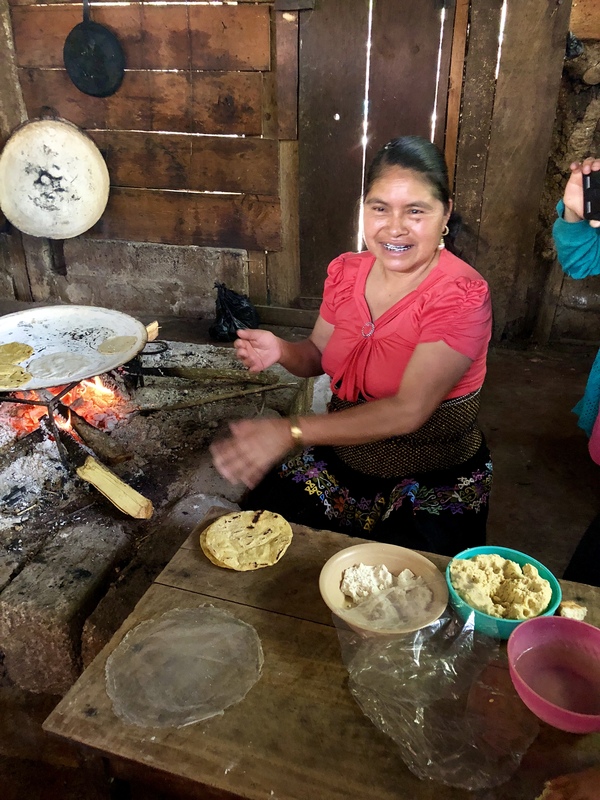 He started the project because he wants to leave a footprint for change, so people can transcend their lives, have access to opportunities, and receive a fair wage. 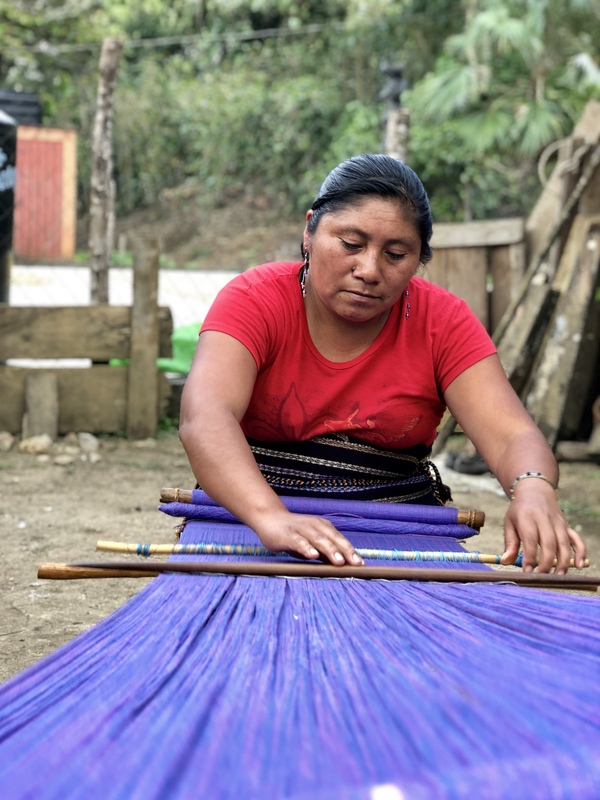 Hilaria weaving one length of cloth for a poncho. 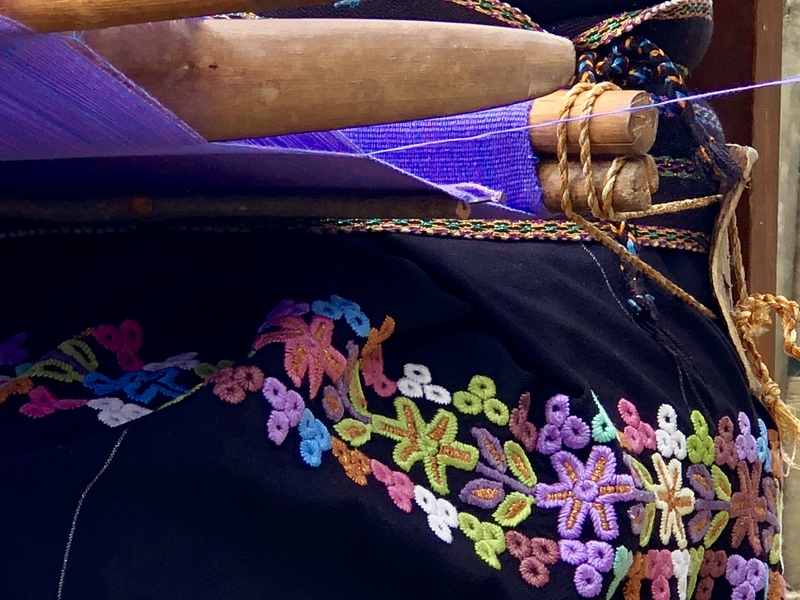 It takes 30 hours to weave a poncho. 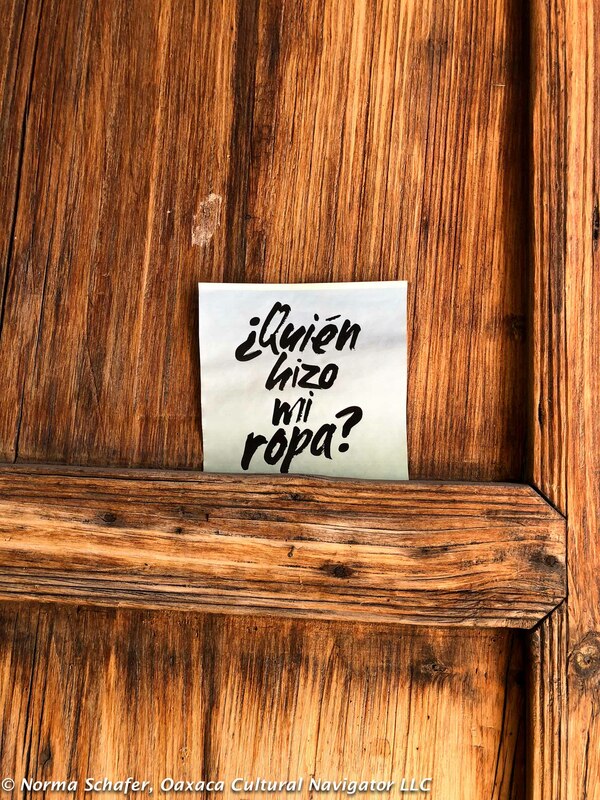 Most women receive six pesos an hour for their work. 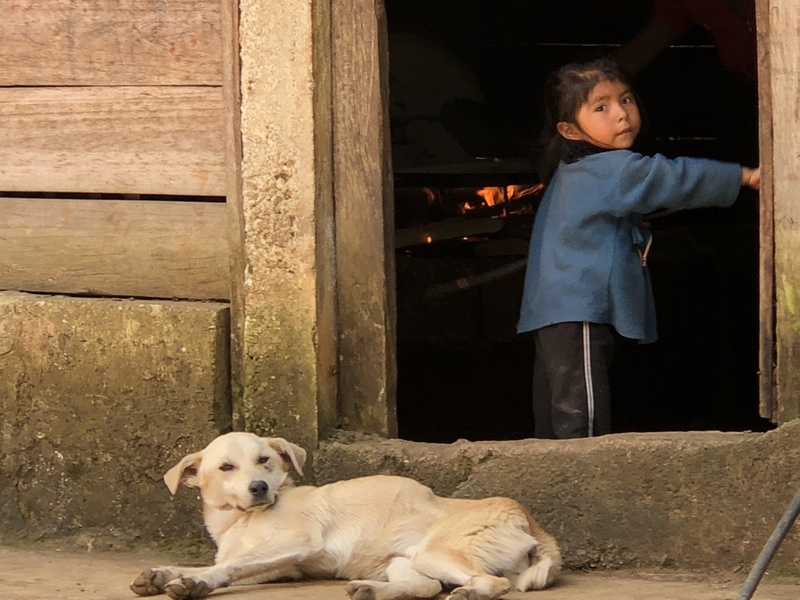 With Huellas, they receive 30 pesos per hour. Mauricio says he wants customers to say: I love your product. I love the quality. I love the price. The retail price is about 30% less than competitors in downtown San Cristobal. The women create their own designs. There are no outside designer influences here. They scan the marketplace and see what’s out there, adjust their styles according to what they see. These are the business practices Huellas Que Trascienden is teaching. Mauricio, age, 38, says he is more of a mentor/coach and not the guy in charge. They are not a textile cooperative or organization. Women receive direct payment for what is sold. 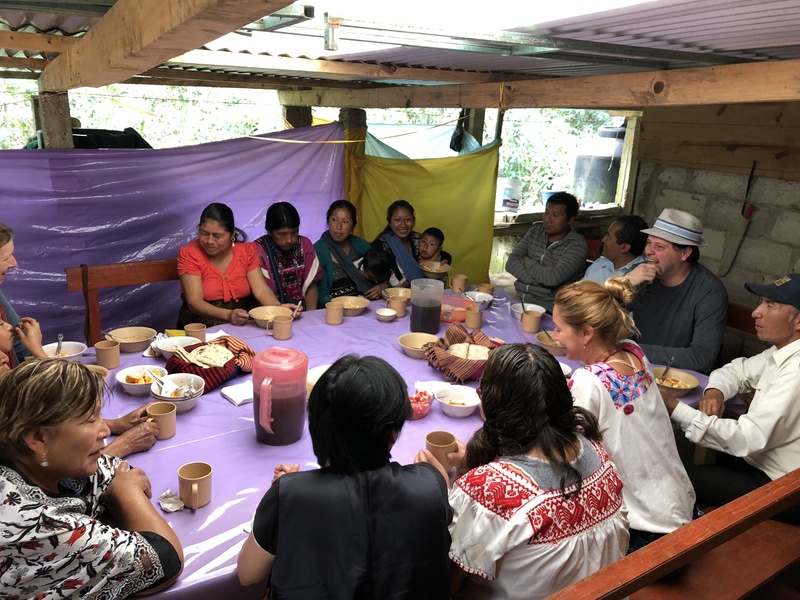 Huellas is working with Amantenango pottery makers, honey producers, coffee growers/roasters, and experimenting with making tea from the fruit of the coffee bean. They are entrepreneurs interested in capacity building and product commercialization. Support them, if you can. 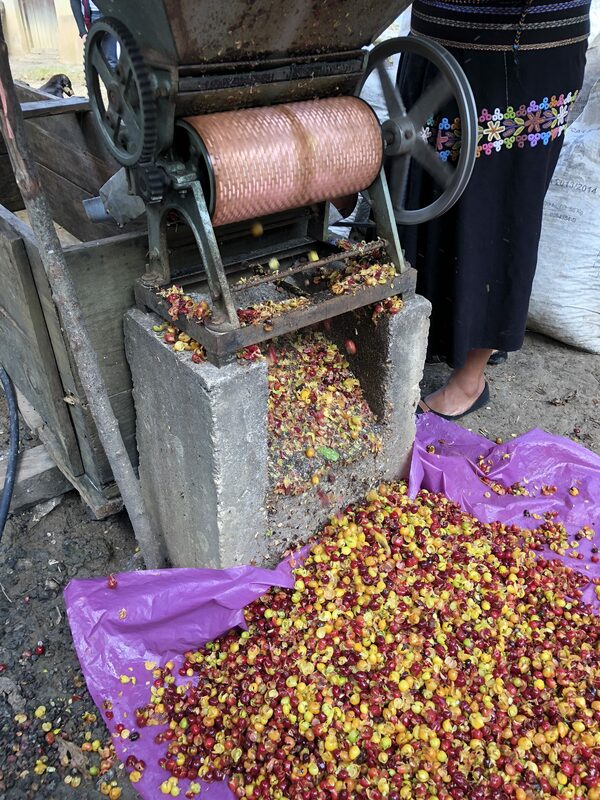 Discarded coffee fruit; can it become antioxidant tea? Thanks to staff member Tali Karszenbaum for her thoughtfulness, customer service, inspiration, and great work with Huellas Que Trascienden. 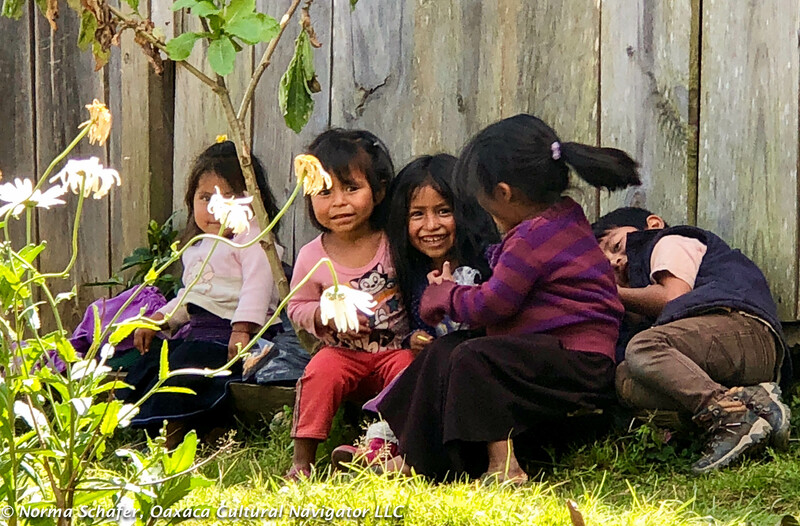 Magdalenas Aldama is an hour-and-a-half from San Cristobal de Las Casas, Chiapas, on a winding road deep into the mountains beyond San Juan Chamula. Its isolation is protection from the forces of modernization. The Spanish had difficulty getting there to evangelize. Traditions run deep and strong. Being remote is a double-edge sword. It guarantees lack of access to education and decent health care. 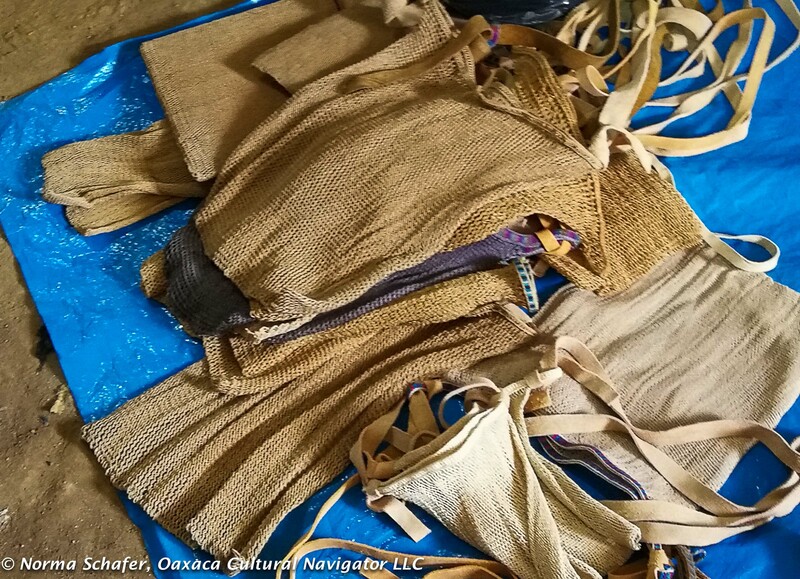 It ensures sustaining traditional practices like building with wattle and daub, creating garments with the back strap loom. This is the same story for many villages tucked into the swales of eight thousand foot mountains around the city. 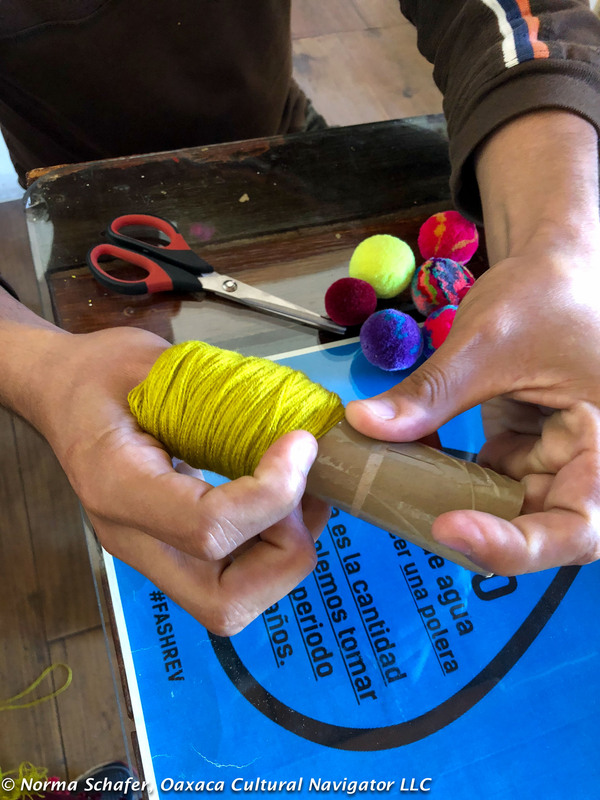 On our quest to explore the textiles of the Maya people surrounding San Cristobal de Las Casas, it is important to meet and know the people where they live and work. 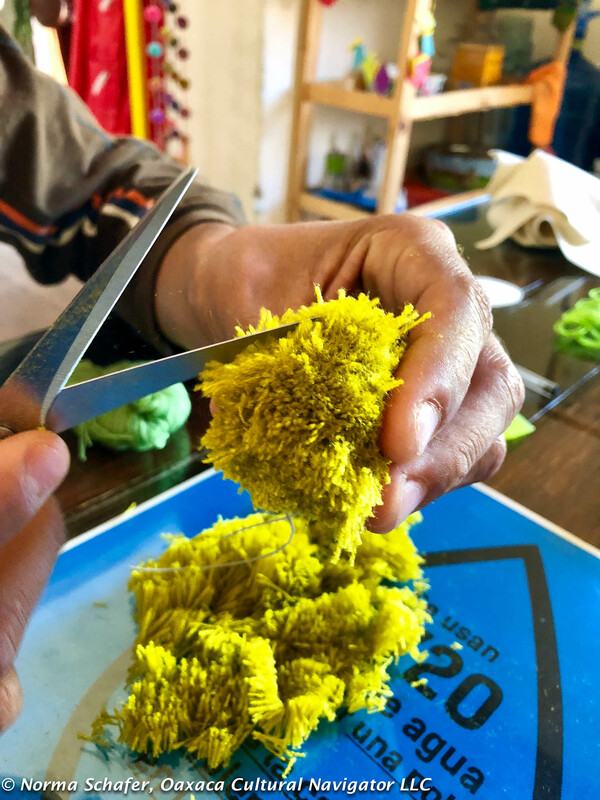 This is a cultural journey to appreciate artisania, to give support and to put funds directly into the hands of the makers. 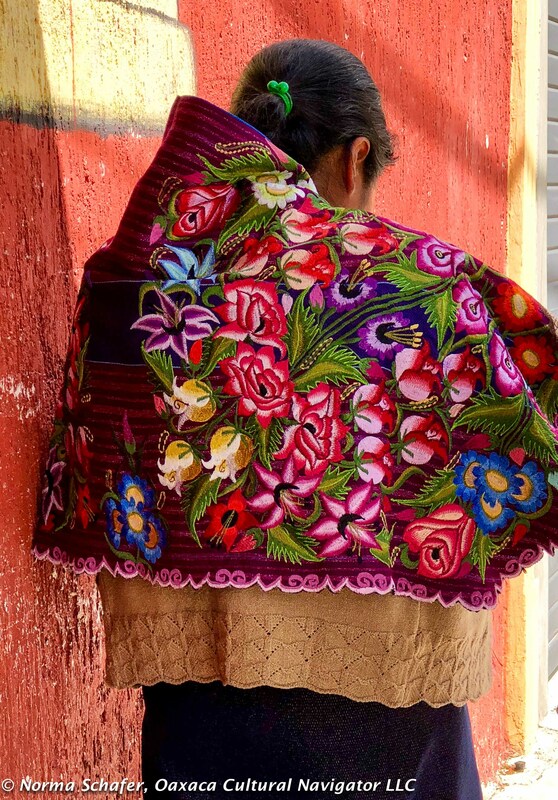 Magdalenas Aldama women weave some of the most beautiful blouses and huipiles in Chiapas. 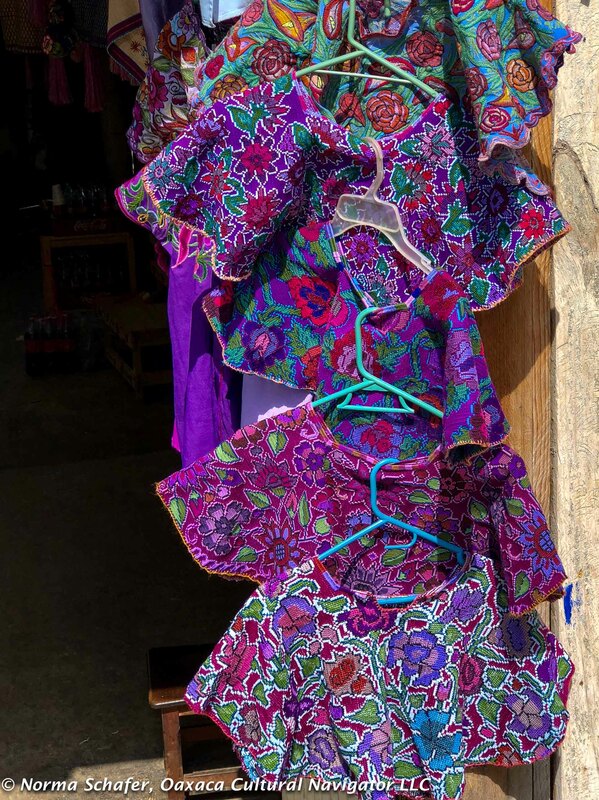 They are intricate textiles with ancient pre-Hispanic Maya symbols that have spiritual and physical meaning. 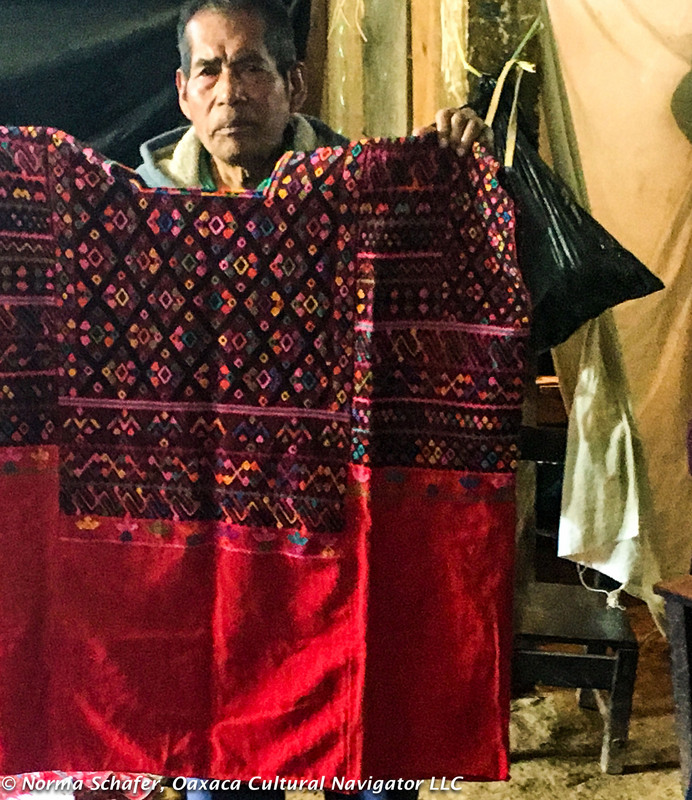 It can take six to eight months to weave a traditional Gala Huipil used for special occasions. 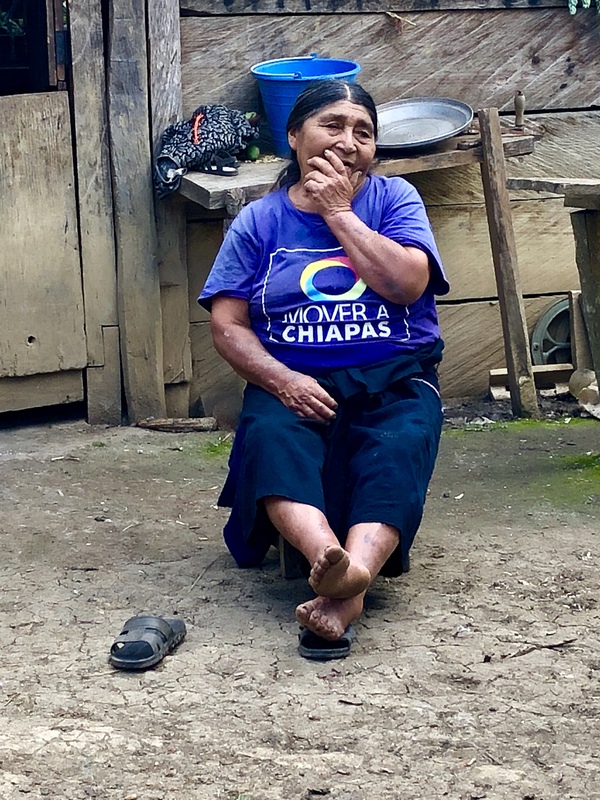 During our van ride we talk about what to look for in a quality garment as we approach Magdalenas. We are sewers, embroiderers, collectors, knitters, appreciators of the creative work that women do. How are the seams finished? Are the seams raw and unraveling? Is the embroidery done on cloth that is made on a back strap loom or is it done on cheap commercial polyester or a poly/cotton blend? Are the embroidery stitches small, tight, evenly executed? Is the weaving even and are the supplementary weft threads densely packed? First stop is to the home of Rosa and Cristobal. They were activists in the Zapatista movement, working for land reform, indigenous rights, access to services, and justice for Maya people. 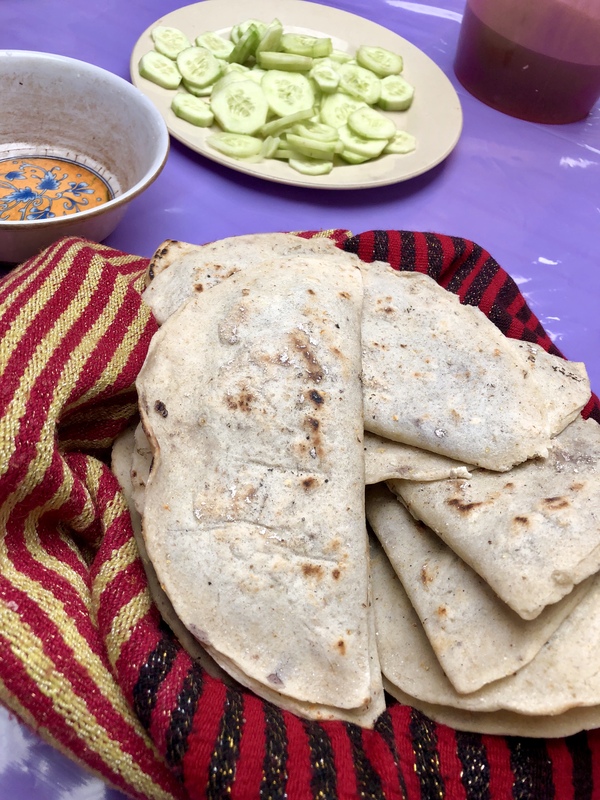 Twelve women in the extended family gathered in the smokey kitchen to prepare our lunch: handmade tortillas, sopa de gallina (free range chicken soup). 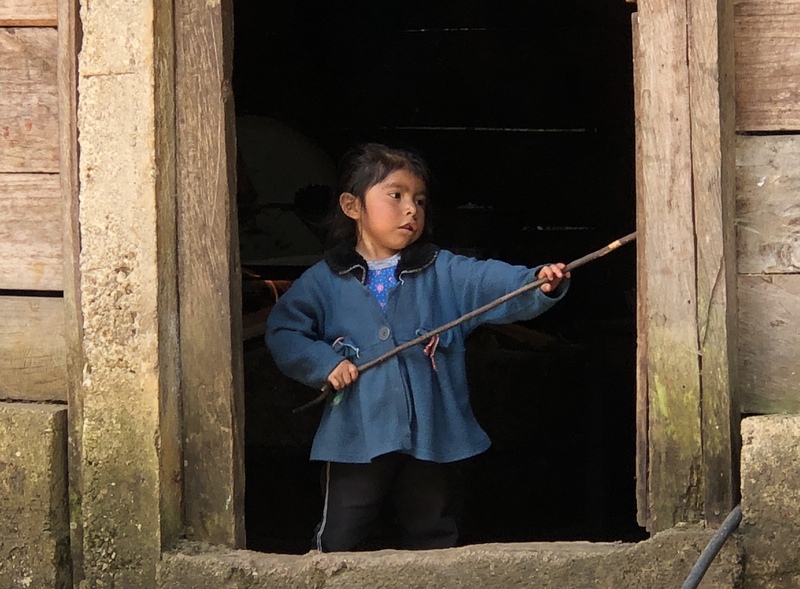 Babies are tied to their backs with rebozos. Toddlers and youngsters played around their mothers’ skirts. The wood fire was pungeant, smokey, making it difficult to see or breathe. 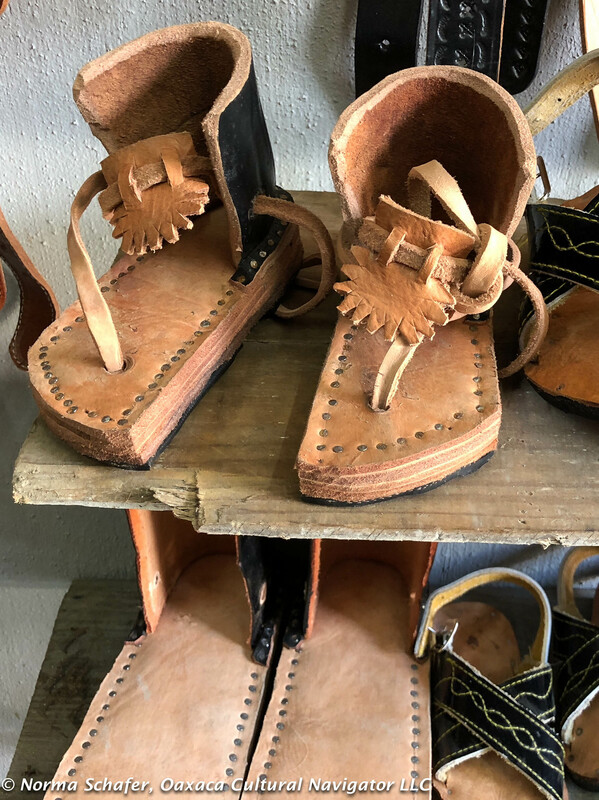 After an expoventa in the adjacent barn, we went to the plank wood house of Don Pedro and his son Salvador, just a few blocks away to see their fine handwoven ixtle bags. 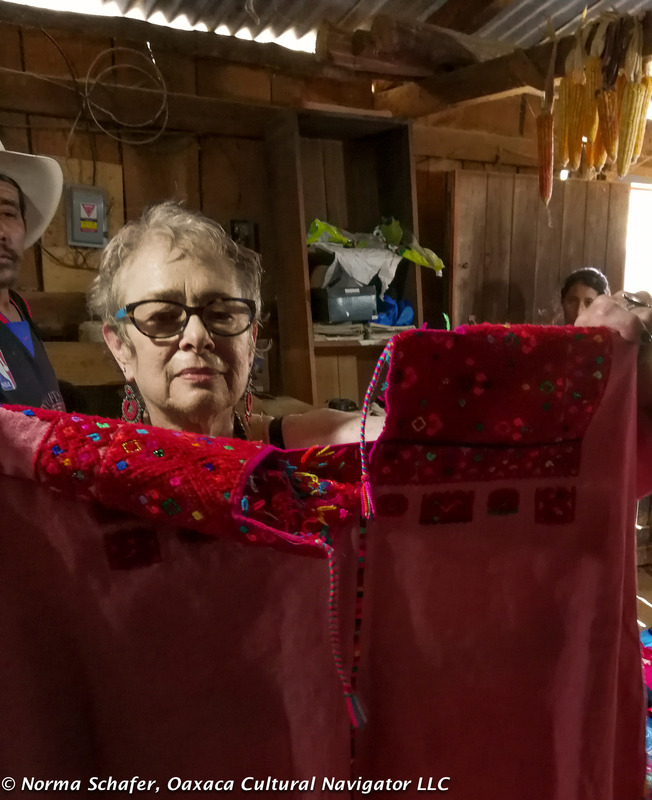 Women in the family brought traditional Magdalenas huipiles and blusas, woven pocket bags, belts and embroidered skirt fabric. Over breakfast this morning we share our impressions of the experience. Lanita commented that this is a culture where back strap looms are everywhere. Women can do it a bit at a time, between caring for children, cooking, tending the kitchen garden, after chores are done. Carol appreciates that joy is possible in any circumstance. 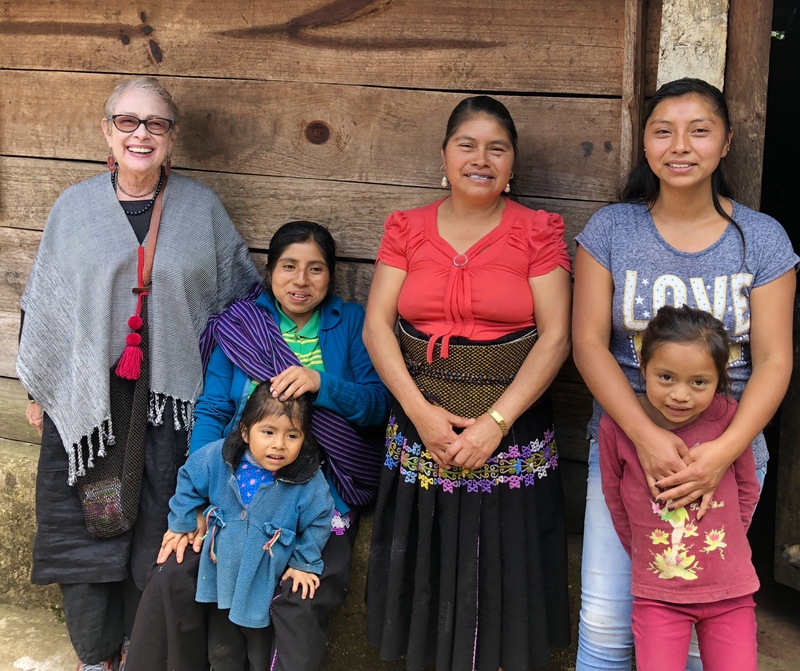 We see the power of a community of women, and as women travelers, we, too, become a community of women. We made connections. There are ore things that make up the same among us that make us different. Children entertaining themselves. No television here. 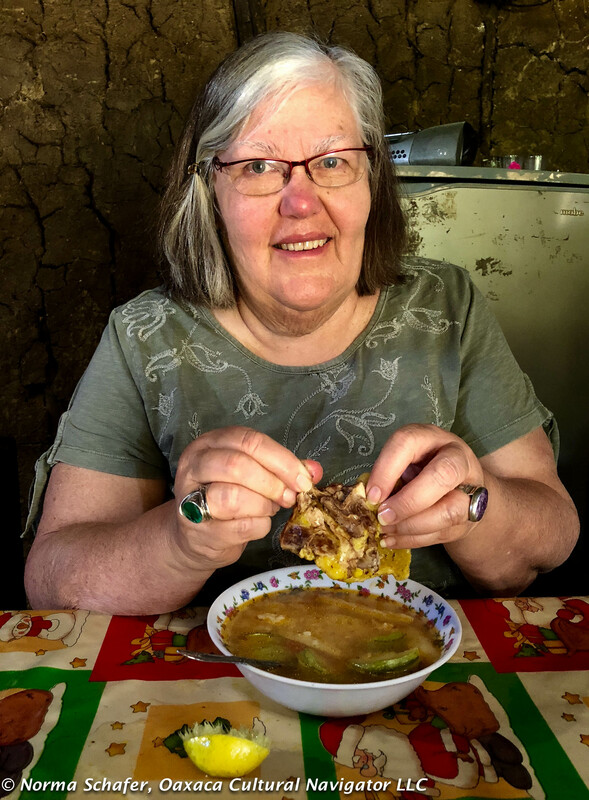 Mary Anne notes that she learned more about the social justice issues of the Zapatistas. They are not a bunch of rebel revolutionaries. Cath says that this trip is more than about textiles, although this is a good place to start. To be here is to look beyond the fibers, to look at the totality of life and ask, Where did this cloth come from? Who made it? What does it mean? Where is the woman who designed it? 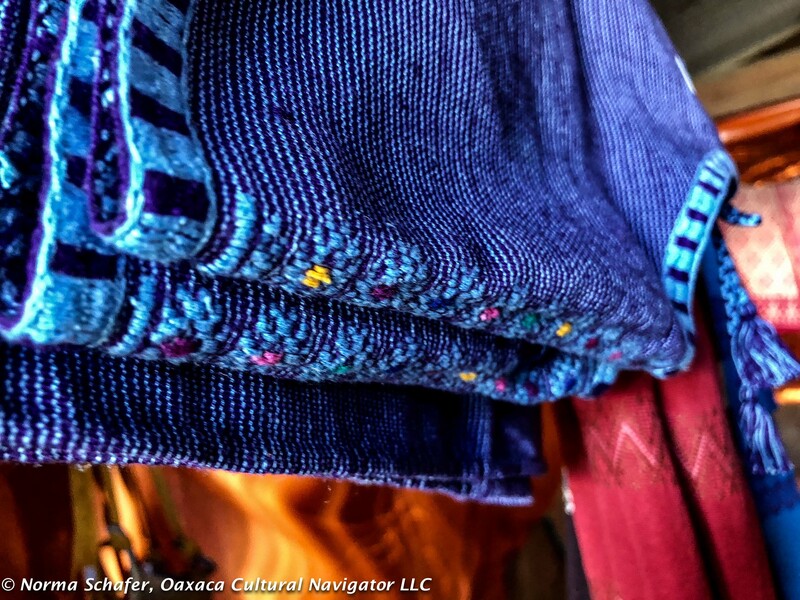 Textiles are a way into being part of another culture. We could dig in, experience, open up to what else it is we can see and discover. 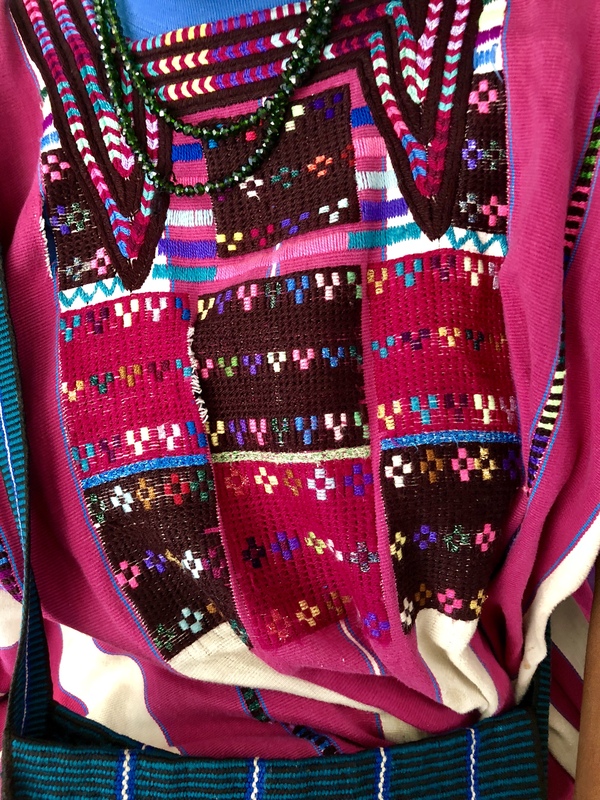 We were excited to find cooperatives where innovative design uses traditional fabric woven on the back strap loom. Most importantly, we provided direct support to women, men and families whose work we appreciate, admire and regard with respect.